The Pilgrims were not experienced farmers, and this was unfamiliar soil and climate. 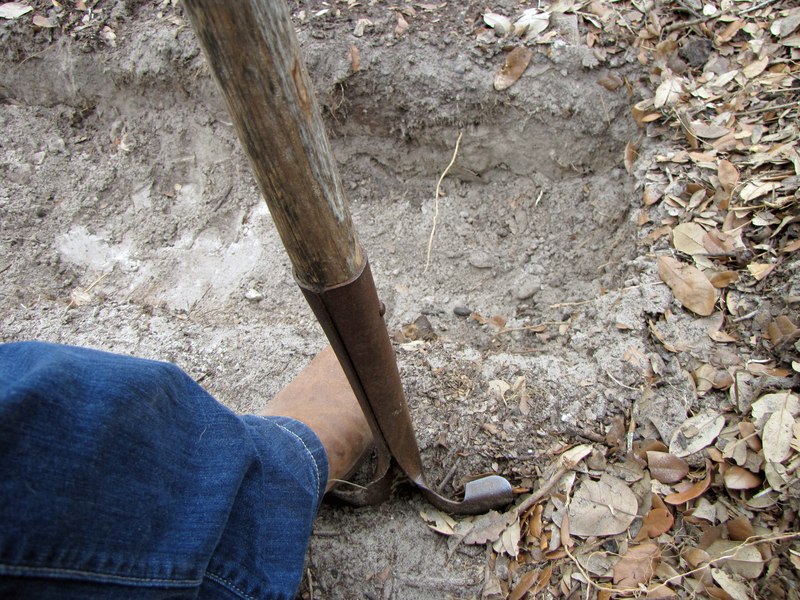 They had no draft animals to pull a plow, and only a few simple tools to break the ground. However, despite these shortcomings, by the following fall, the Pilgrims had grown enough vegetables to hold a three day feast, the First Thanksgiving, to thank God for their bounty. They had even preserved enough food to last them another six months. So, how did the Pilgrims accomplish this remarkable feat of agriculture? The familiar legend tells how the Indian Squanto taught the Pilgrims to plant corn with fish buried beneath as fertilizer. However, that is not the complete story. If the Pilgrims had simply planted a straight-row monoculture of corn, the crop very likely would have failed. What Squanto actually taught the Pilgrims was how to plant corn, beans, and squash together, in a companion planting technique called the Three Sisters. It was Three Sisters gardens that produced such a bounty of vegetables for the Pilgrims. 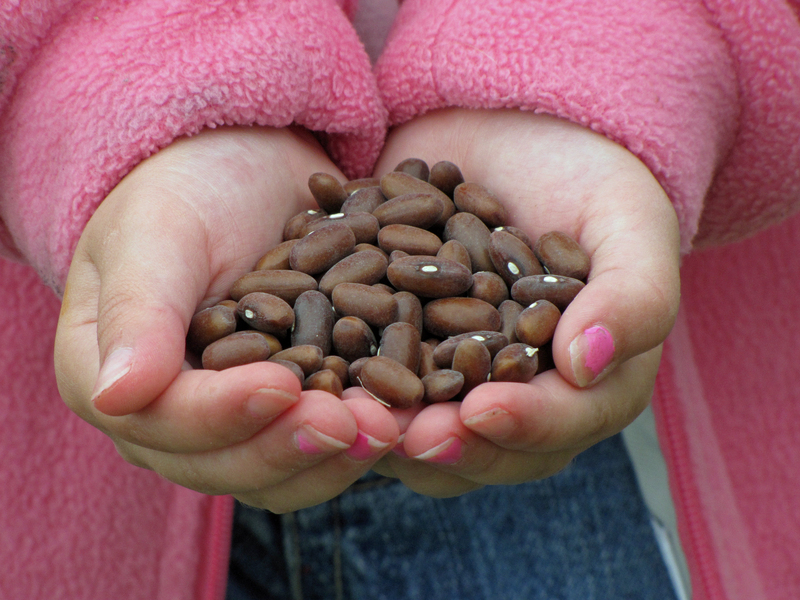 Beans are a nitrogen fixer; they fertilize the corn as they grow. The squash leaves choke out weeds, keep the soil cool and moist, and provide a sanctuary for beneficial predators. The gardens are dense and lush, and the plants ripen in continual successive waves. 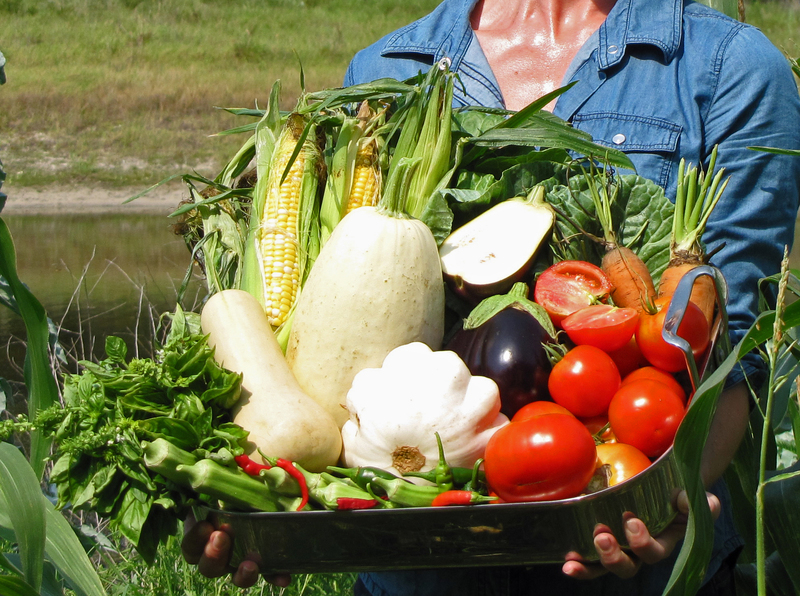 Of particular importance to Pilgrim and Indian farmers, corn, beans, and squash are highly nutritious. When eaten together, the Three Sisters are a complete and balanced meal, rich in carbohydrates, protein, vitamins, and minerals. And these foods store well for long periods of time. 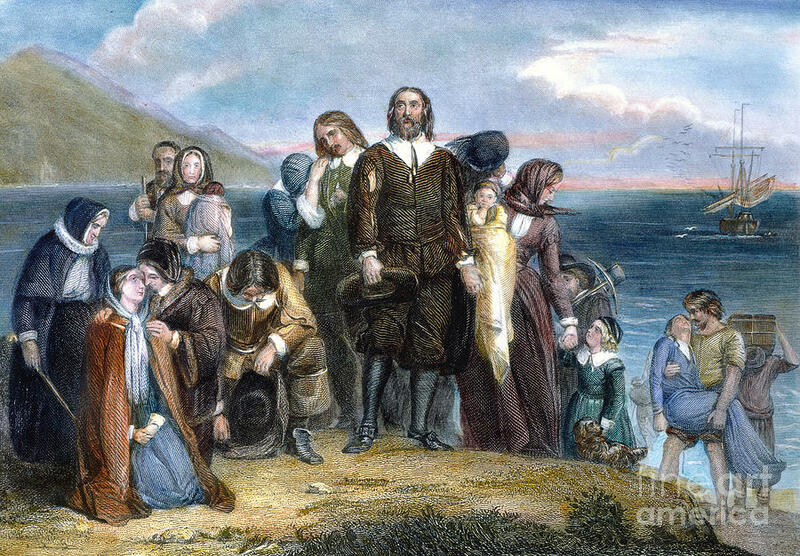 Following the First Thanksgiving, each Pilgrim family was given their own plot of land to farm, and corn, beans, and, squash constituted up to 70% of the Pilgrim’s diet as the colony grew. Three Sister gardens continued to be planted extensively throughout North America, until the early 20th Century, when industrial farm equipment replaced small-scale farmers, and the old ways of farming were forgotten. However, we modern gardeners can take a lesson from that First Thanksgiving. Three Sisters gardens work just as well today as they did for the Pilgrims 400 years ago. 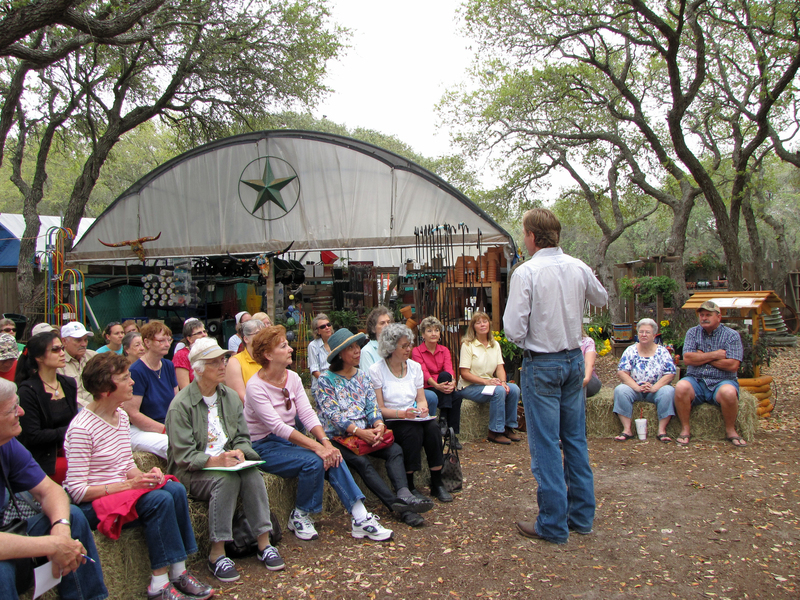 Following are the notes from our class on Three Sisters Companion Gardening. These notes are a detailed guide to the basic planting system we used to pioneer our farm. This gardening method was invented by Native American Indians more than 1,000 years ago. It was innovated and improved in American soil over many centuries. Indians and rugged pioneer farmers used this method to sustain their families as they settled a great wilderness. We hope these notes help you pioneer your own space and grow your own beautiful garden. Thank you so much to everyone who joined us on Saturday. Mr. Moore counted 89 folks in attendance! Thank you, friends, for your engagement, your enthusiasm, and the many great questions. 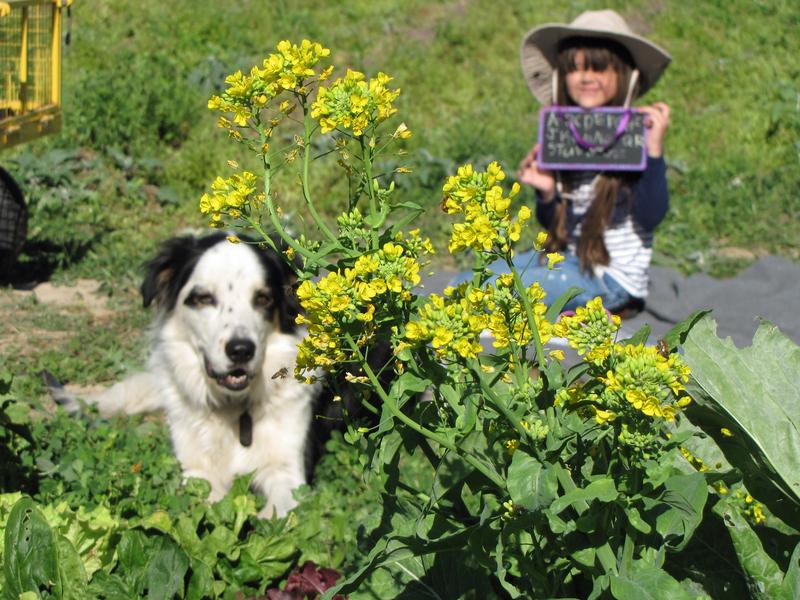 Kayla and I had a lot fun sharing a wonderful morning of gardening with you! We encourage you to take a picture of your space before you begin planting, and another picture when your garden is full and lush. I will gladly post your pictures this summer to celebrate our gardens. 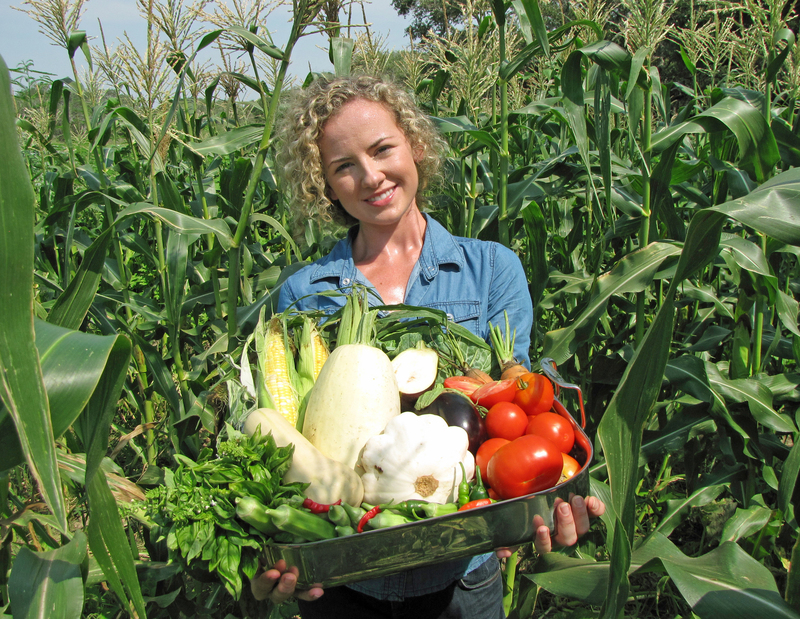 I believe that seeing your successful harvest will inspire many other folks to begin their own gardens. I welcome your comments, questions, and feedback. Please submit questions or thoughts on the “comments” section of this post. That way, we can all track questions and answers in a common place. 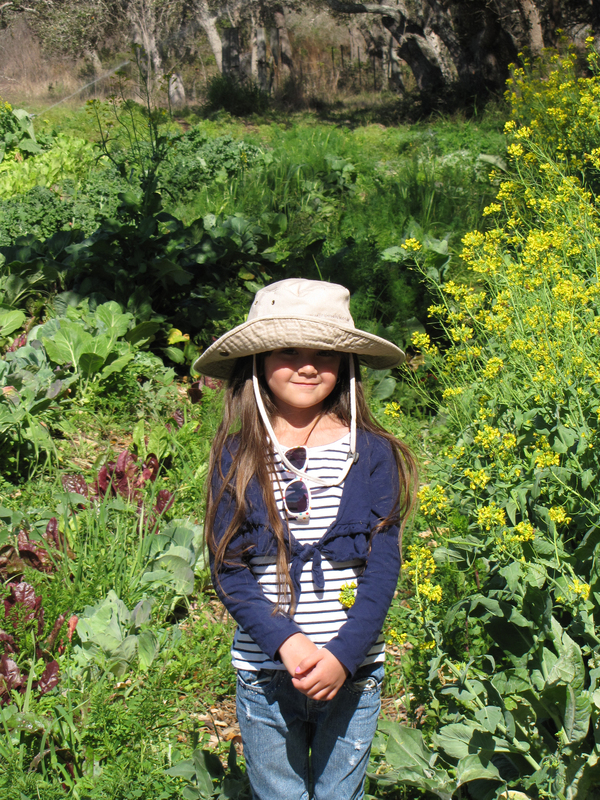 Goal: To grow prolific, delicious, healthy summer vegetables and herbs with the least amount of work, money, and time. 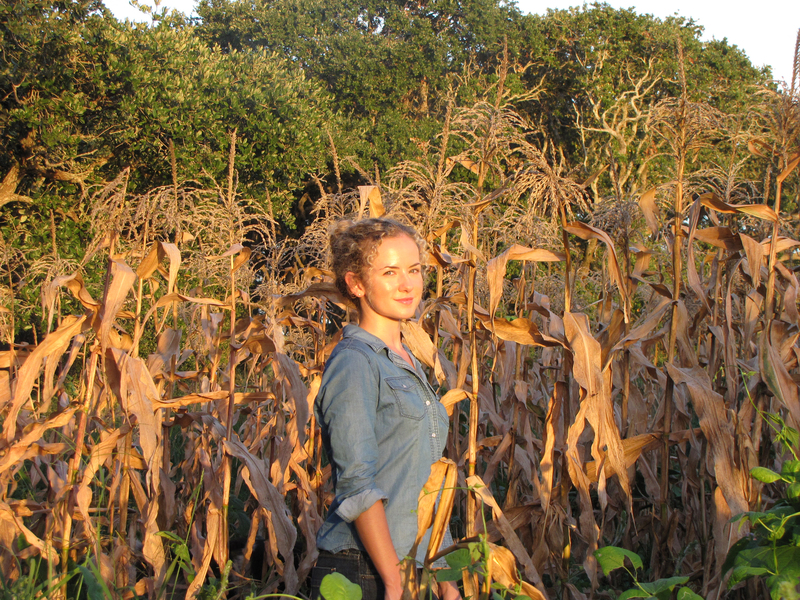 Three Sisters: Harvesting beans from a corn stalk trellis. No synthetic chemicals: Round-Up (glyphosate), Ortho, Sevin, or Scotts Miracle-Gro products. We have nothing against these chemicals, and I fully understand the role of chemicals in large-scale agriculture. However, these chemicals were designed for big industrial farms, NOT backyard gardens. These chemicals are extremely inefficient and expensive in a backyard garden, and generally do more harm than good. There are more effective heritage methods that require less time, money, labor, and also produce healthier and better-tasting food. Once you understand the principles of the Three Sisters, you will be able to adapt this method to your own garden space. The beauty of this system is how easy it is to plant, and how effectively it grows all on its own. Corn serves as a trellis. The pole beans grow up the corn stalk trellis. The beans fertilize the soil through nitrogen fixation, taking nitrogen molecules from the air and attaching them to microbes in the soil. The squash covers the soil all around the planting as a living mulch, to shade the soil, preserve moisture, and prevent weeds. This dense garden is a sanctuary for beneficial predators. 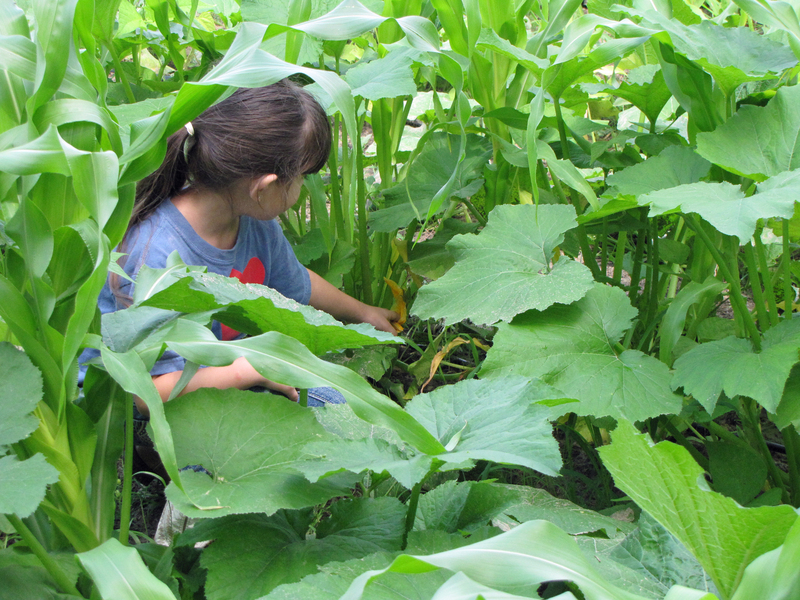 Corn pollination: To make this garden work, the corn must be densely planted. Corn is self-pollinated (also called wind-pollinated). 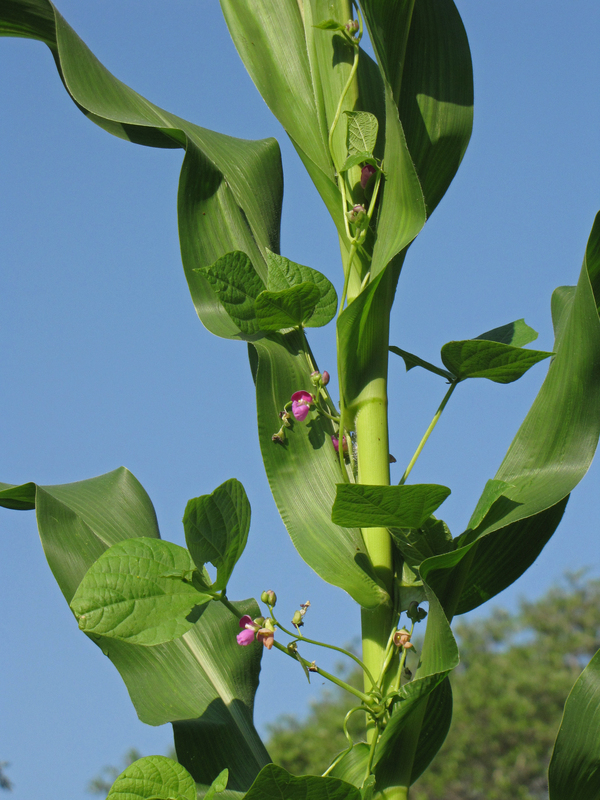 The corn plant possesses both the male and female parts. The corn tassel is the male part, and the pollen falls down to the corn silk growing from the cob. As soon as the pollen touches the silk, a tube develops down the silk to the kernel, pollinating and setting the kernel. There are between 700 and 1,000 potential kernels on each cob, and you want as many kernels pollinated as possible. Densely planted corn assures maximum pollination. 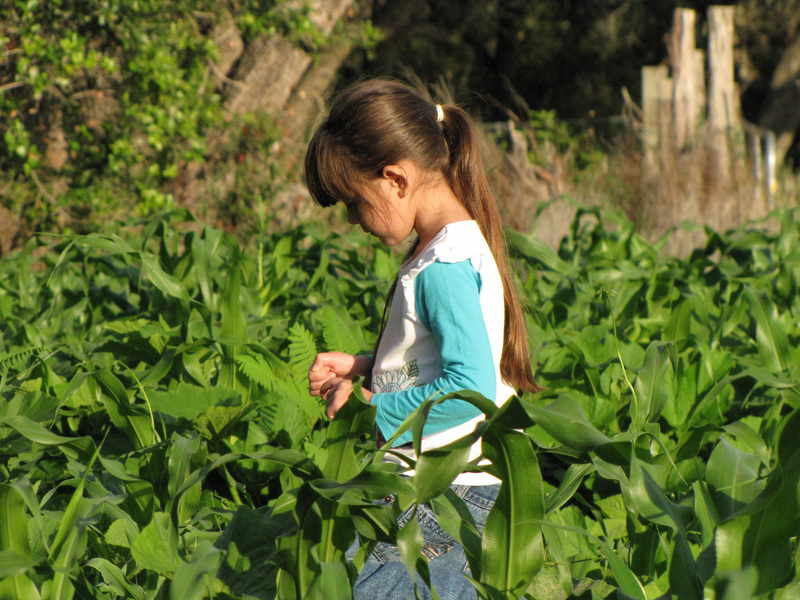 If the corn plants are spaced too far apart, they may not achieve good pollination. Drought, heat stress, bug damage, and uneven watering can inhibit pollination. Also, you should only plant one variety of corn in each mound, or section of garden. You want the same variety of corn, to make sure the pollen matches the silk. Beans: Pole beans, or vining beans, grow up the corn stalk. You do not need to help this, it happens all on its own. We use pole beans to expose more of the bean vines to the sun, rather than bush beans, that could be shaded out by the corn and squash. The bean vines help anchor the squash into the soil. 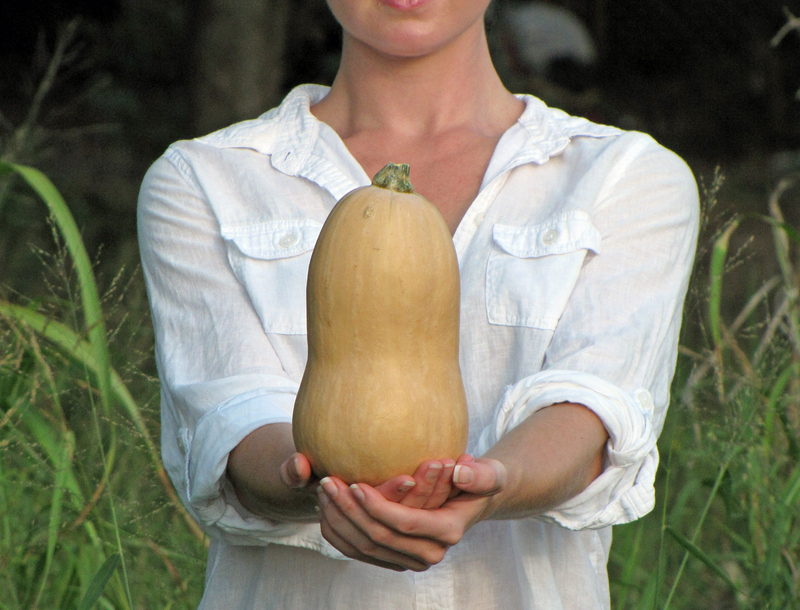 Summer and Winter Squash: There are several differences between summer and winter squash. All are grown in the summer, and all squash will freeze or die in a hard frost. Summer squash matures more quickly, usually in 50 to 80 days. Winter squash matures more slowly, usually 80 to 100 days. Summer squash have thin, edible skins, and are eaten when they are less mature, even with the flower still on them. The seeds are found throughout the flesh. Summer squash do not store well, and should be eaten at the peak of ripeness. Zucchini, yellow crook-neck and straight-neck, and scallopini, are examples. Winter squash have thicker skins, which are sometimes tough or inedible (butternut is a good exception). The seeds are stored in hollow cavities in the center of the vegetable. The tough skins allow winter squash to be stored for a long time. In olden days, they were kept in root cellars, and eaten late into the winter, which is why they are called “winter” squash. Butternut, acorn squash, and spaghetti squash, are examples. Summer squash grow as a “bush” variety, while winter squash is typically “vining”. Both varieties can be grown interchangeably in Three Sisters plantings. Cucurbit Family: All types of squash, pumpkins, cucumbers, and melons. All can be used in the Three Sisters garden. Pumpkins: Pumpkins are the traditional vining gourd planted in Three Sisters gardens. However, Indian pumpkins hardly resemble what we call a pumpkin today; they were much smaller and all parts were eaten, and they stored extremely well. Also, they could get many more pumpkins per plant than our modern huge “jack-o-lantern” type pumpkins. We don’t particularly recommend pumpkins for Three Sisters gardens, only because they produce a huge vine presence for only a few, or even one, full-sized modern pumpkins. Also, pumpkins can take 16 weeks to mature, long after the corn and beans have finished. New gardeners should be prepared for this long time to harvest, and the relatively lighter harvest, compared to a zucchini or butternut squash. Cucumbers: Cucumbers are vining plants that work very well in this garden. More seeds should be planted, as each seed will turn out about 8 to 10 medium sized cucumbers, and you will need more plants to create the vine density required to provide good living mulch. You can always thin plants if they are too crowded, more easily than you can plant new ones half-way through the growing season. Cantaloupes and Watermelons: Like pumpkins, watermelons take the longest time to mature in the garden, and you will only achieve a few mature melons per plant. 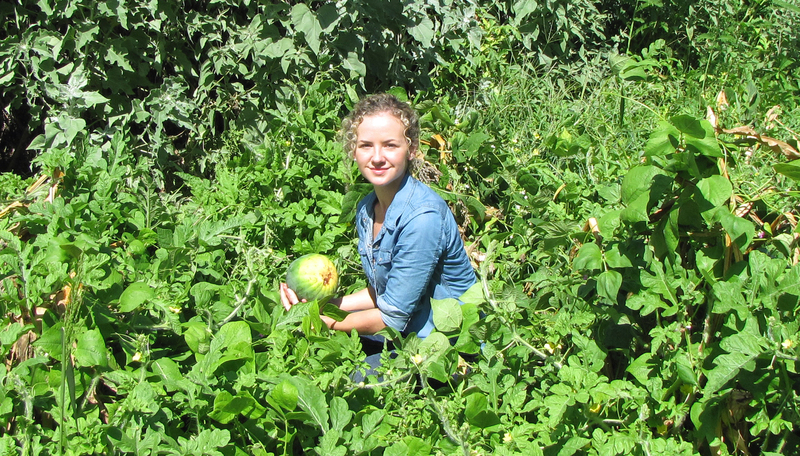 Also, vine growth of watermelons is extremely thick and dense. 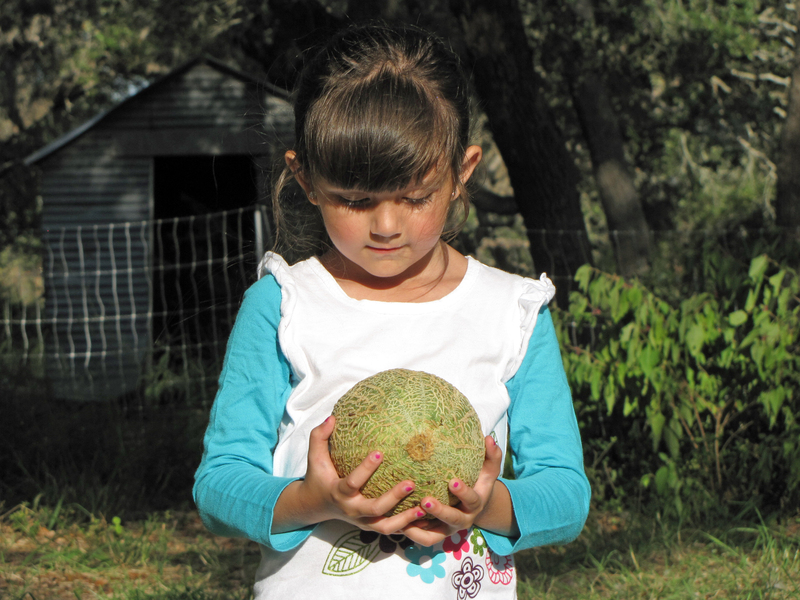 Canteloupes are easier to grow and are not as “wild” and thick as melons can become. Aromatic Herbs: Dill and basil are particularly effective companions with Three Sisters. Let them flower and go to seed. They will grow spindly and bushy, but you can still harvest from the leaves, flowers, and even the seeds. These herbs help repel and confuse pests, and help attract beneficial predators to the garden, and are delicious. Wildflowers: Nasturtiums are excellent in this garden. Plant them as thickly as you like. Nasturtiums help repel squash beetles and attract beneficial predators. Feel free to inter-plant any type of native wildflowers into this garden. The more flowers in the garden, the more bees and beneficial predators. The Three Sisters garden MUST HAVE 8 hours of full sun. Healthy soil has the optimum amount of vitamins, minerals, and nutrition for the plant, in the ideal availability for the plant to absorb it; efficient feeding. Healthy soil requires less water; watering can be cut by up to 80%. Healthy soil “holds” the water better in a form easiest for the plants to uptake the water. The best pesticide is healthy soil. Why? Because healthy plants are very resistant to disease and bug damage. Weak soil -> weak plants-> most bugs. Healthy soil is also the best fertilizer. 90% of the beneficial bacteria and micro-organisms, the “life” of the soil, is found in the top 4 inches. This top layer MUST be protected at all times through mulch and intensive plantings; it dries out the fastest and receives the most abuse. Plant roots take nutrients from deep in the soil to the top. When Thomas Jefferson’s daughter wrote him a letter complaining that bugs were eating their crops, he said the problem was the weakened state of their soil, and they needed to get cover crops and manure on the gardens, and the bugs would go away. We use animals cycling on mature gardens to prepare soil. Our goal is to translate our program to a backyard garden. Animals = manure, urea, micronutrients, pest control. Urea (or urine) is extremely high in nitrogen; 2/3rds of the nitrogen and 4/5ths of the phosphorus expelled from an animal is in the urine. Also, urine is highly soluble, the form easiest for soil and plants to utilize. (For this reason, we recommend only pastured poultry manure for backyard garden, where the urine is in the manure, rather than cow or horse manure–also commercial cow manure usually comes from feed lots, and you DO NOT want that in your garden.) Further, when animals are on our gardens, they are feeding on mature crops, the green material and left-over produce; so, they are recycling extremely healthy and chemical-free feed into extremely high-quality fertilizer. Chickens till top 2” to 4″ of soil, the pigs 10″ to 12” deep. This thorough tilling is extremely important to aerate the soil. You cannot get same effect with a commercial tiller in your backyard garden–you have to dig up the soil, as explained in “Bio-Intensive Dig” in the next section. Pigs also eat out the root system and turn the roots into pure fertilizer. Even when placing pigs on a bare garden, they begin to feed on roots and it smells like a freshly mown lawn for about a week. As much green material as was growing on top of the garden, there is that much in roots beneath the soil. Chickens eat the green material on the surface and clean up a lot of pest insects. We spray molasses tea on garden after removing animals to breakdown manure, then let it sit 2 wks, then plant next garden. 90% of nutrition and beneficial bacteria are in the top 4″. 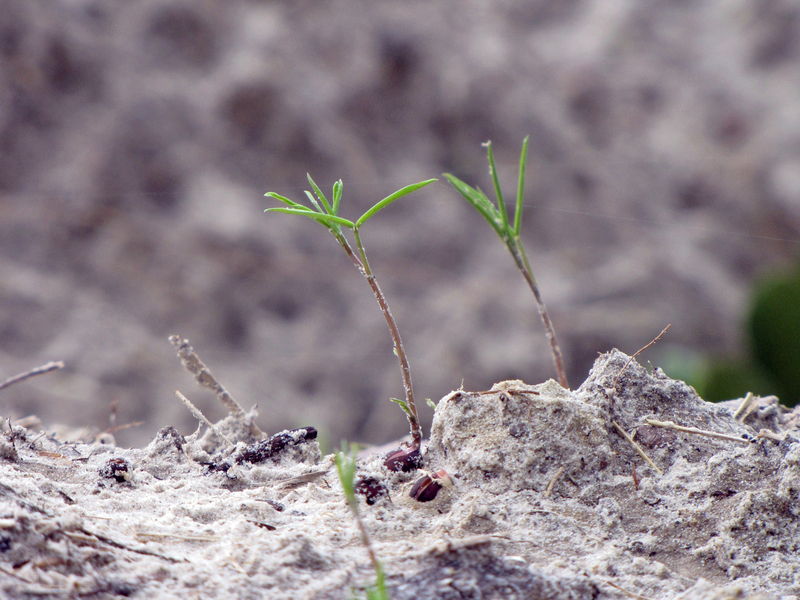 This top living layer of soil must be protected. Our garden soil is entirely made up of our native soil improved with: 1) oak leaves broken down into the soil, 2) animal manure, and 3) the trampled green material from plants. You can make your own soil in the same way; however, instead of putting animals on your garden, pull up all your green material and compost it with oak leaves, and when the compost is ready put it back on the garden. It will take you a little longer, but you will eventually build extremely rich soil that is completely unique to your garden. 1) clear the row as much as possible of brush, grass and debris. No herbicide is necessary, as the weeds will be dug up. 5) DO NOT walk on row after digging. 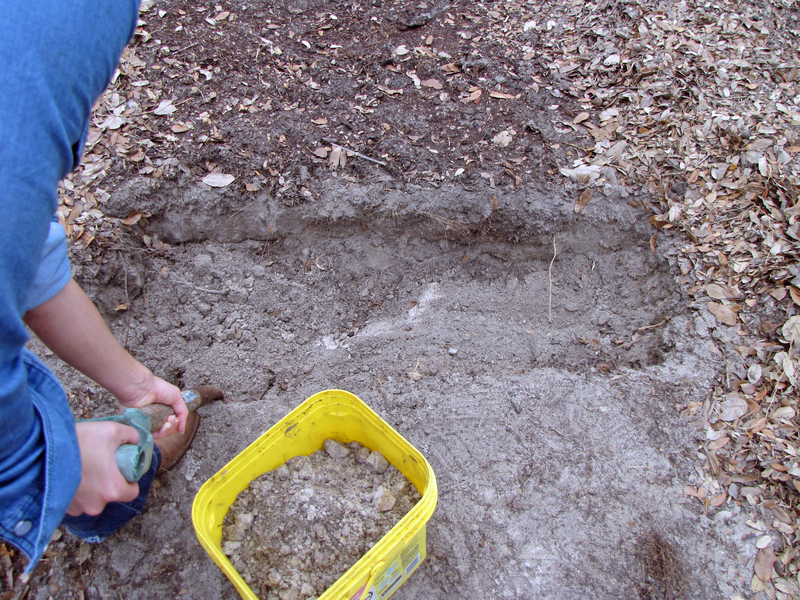 The soil will be “fluffy” and highly aerated; stepping on it will hurt the structure. 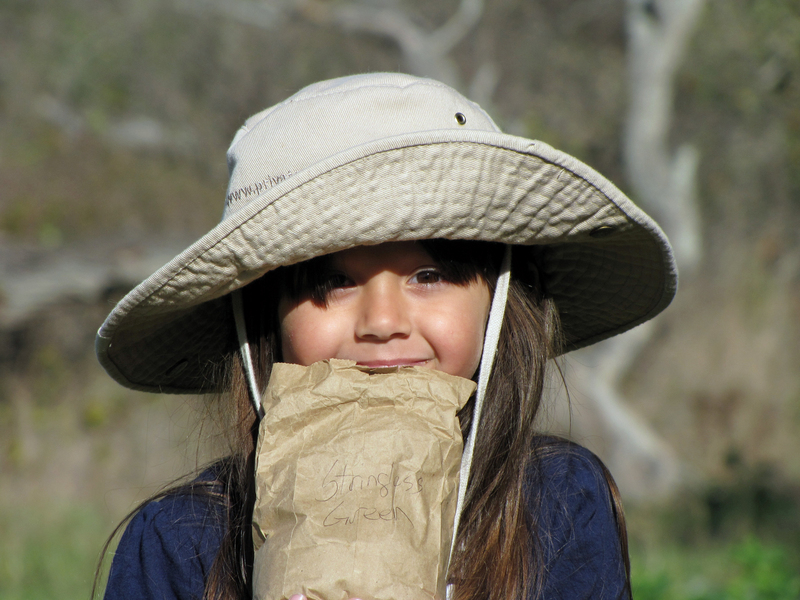 6) Add another ½” layer, or more, Ladybug compost, and another thin layer of Texas Greensand. 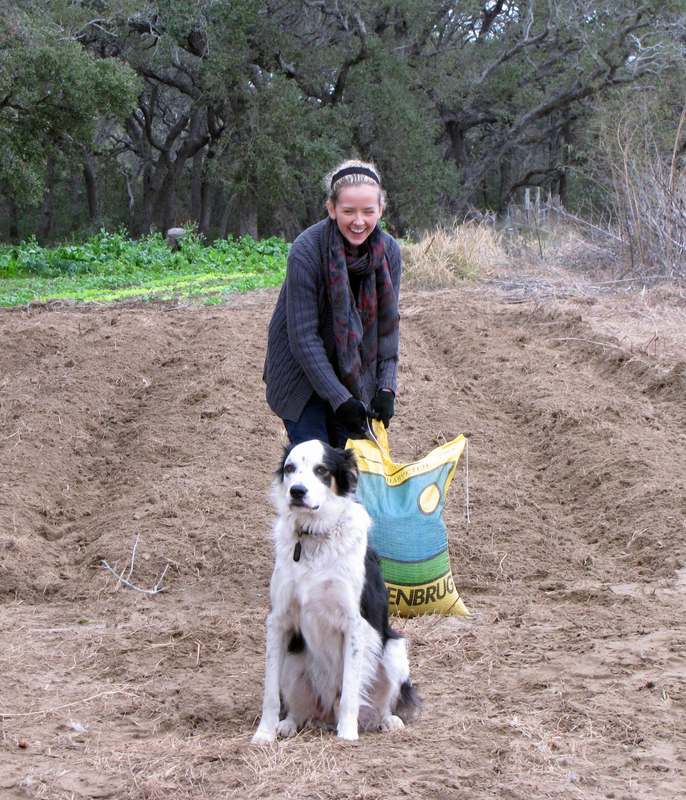 You can’t add too much compost, but a half-inch or inch over the finished row is plenty. 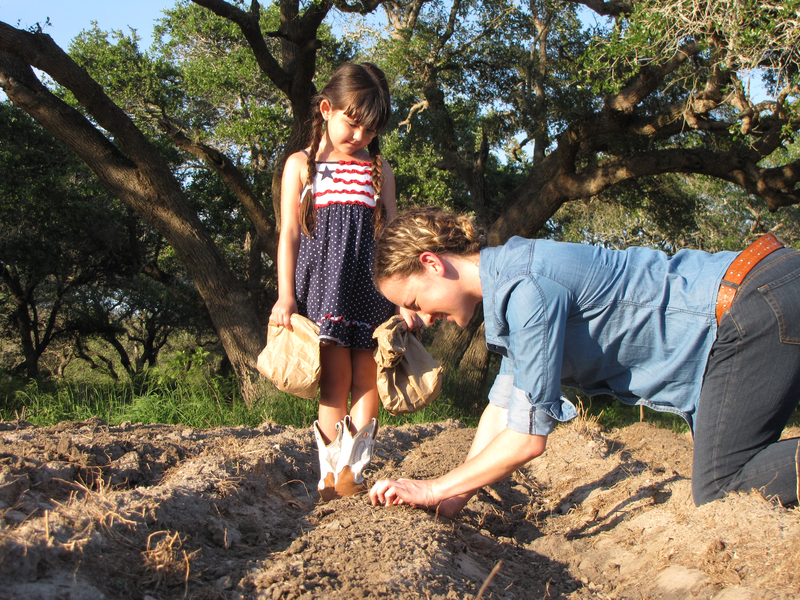 The next time you need compost after this planting, you will have made your own! The row is ready for planting. The BIO-Intensive Dig Method only needs to be done on the first new garden, and then maybe every 3 or so years after the first planting. The second dig will be very easy and fascinating, as you see the difference in the soil you created. Prepare the soil for a 3X3 foot garden (compost and greensand on top, Bio-Intensive dig, more compost and greensand, crushed oyster shells, live oak tree wood ash). Plant 1 corn seed at each corner of a 12” square. Plant the seed 1” deep (or lay all seeds then cover with 1” of compost). Plant 1 pole bean seed next to each corn seed. Plant the seed 1” deep (or lay all seeds then cover with 1” of compost). Plant squash of your choice 6” outside the straight line of the square. 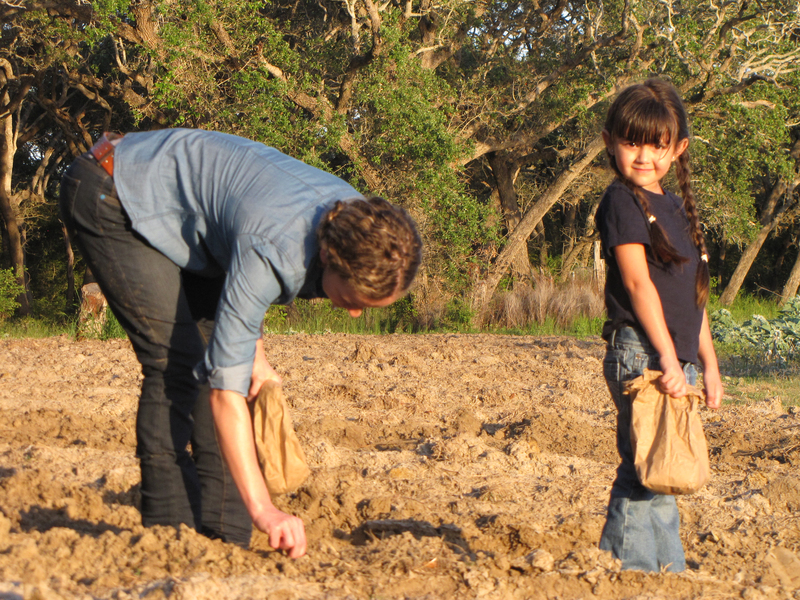 Plant the seed 1” deep (or lay all seeds then cover with 1” of compost, plus small amount of greensand, crushed oyster shells, and live oak wood ash.). Plant aromatic herbs and wildflowers 12” outside each corner of the square. They will be close to the far corners of your 3’X3′ space. This is to give the herbs and flowers time to start growing before the squash vines begin to cover them. Place irrigation line down center of square. As soon as shoots of plants come up, add oak leaf mulch around the plants. Continue to add mulch as plants grow, up to 10 inches deep. Around 30 days after corn is finished, and once all vegetables are spent, place the plants in the compost pile. Leave oak leaf mulch on garden, so it is ready to plant for a Winter garden. Make a 1” trench down the center of each row. Drop corn seed 12” apart down the trench in the center of each row. In the same row, drop one bean seed about 1” from each corn seed. In the same row, drop 3 squash seeds 24” apart, in between every other corn/bean seed. 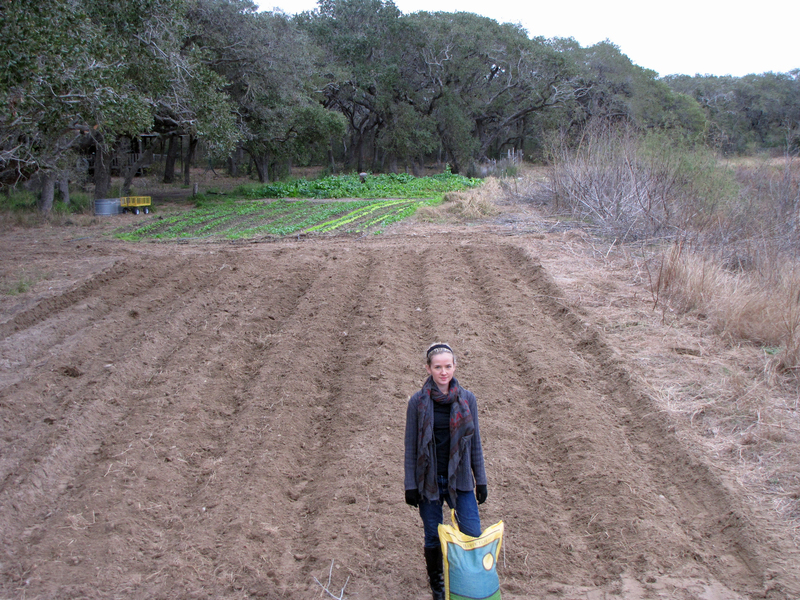 Now, cover the row with 1” compost, plus small amount of greensand, crushed oyster shells, and live oak wood ash. Repeat this process with the other two rows. Place drip line irrigation over center of each row. Cover all the garden with oak leaf mulch, leaving the centers of the rows uncovered until the seeds sprout, then mulch around the plants as they grow. Make sure the space receives AT LEAST 8 hours full direct sun. An east/west line with fence or house on north side, for example, may get enough sun. Prepare the soil for a 3’ wide garden bed. Make 2 parallel trenches, 12” apart, down the length of the row. Drop corn and bean seeds down each row, 12” apart. Plant 3 squash seeds 24” apart ONLY in the row of corn/beans away from the fence or house. This will allow the squash to fill out the garden bed as living mulch, and then grow out away from the fence. 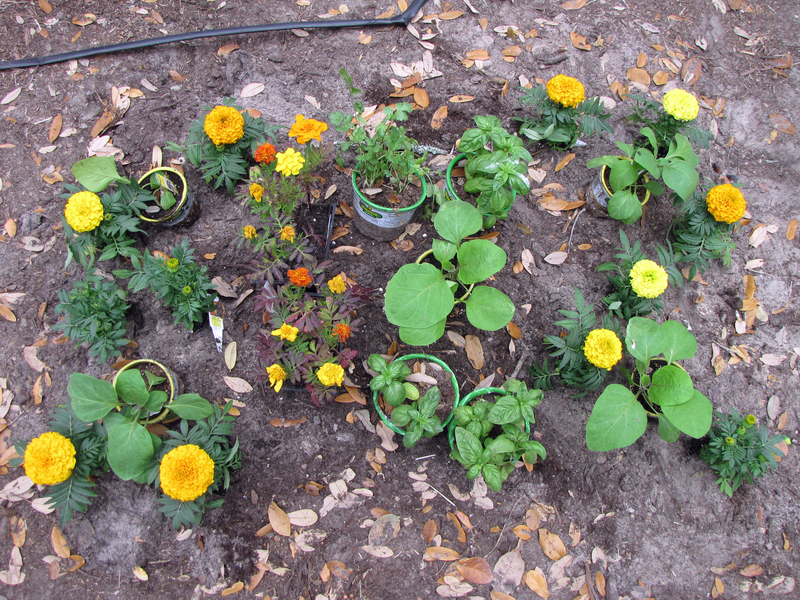 Thickly plant aromatic herbs and wildflowers in spaces between where squash was planted. 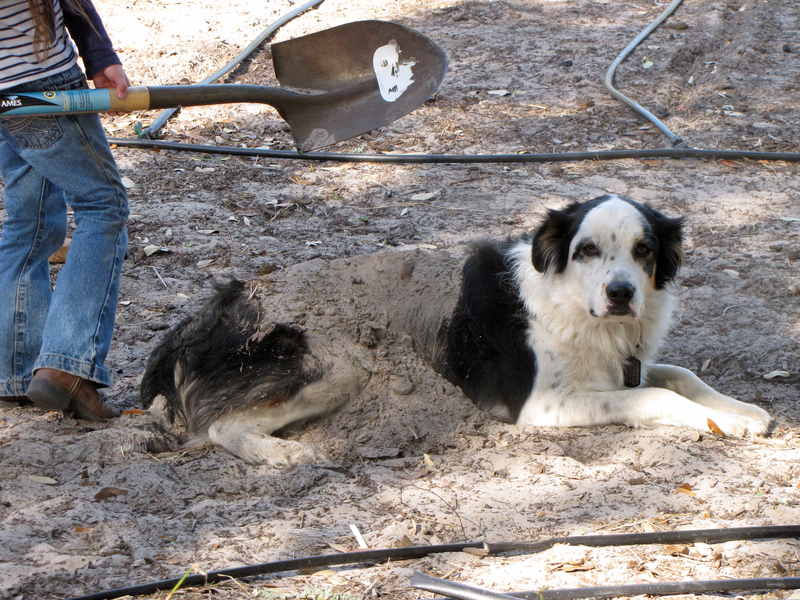 Now, cover the garden bed with 1” compost, plus small amount of greensand, crushed oyster shells, and live oak wood ash. Place drip line irrigation over center of row. Cover the bed with oak leaf mulch after plants fully sprout, then mulch around the plants as they grow. Corn: Harvest when kernels are full, round, and plump, all the way to end of the cob. When you pinch a kernel, the juice should be half-way between milky and clear. You can pull the green sheath carefully back to check the cob, but make sure to fully replace it, to protect the kernels. 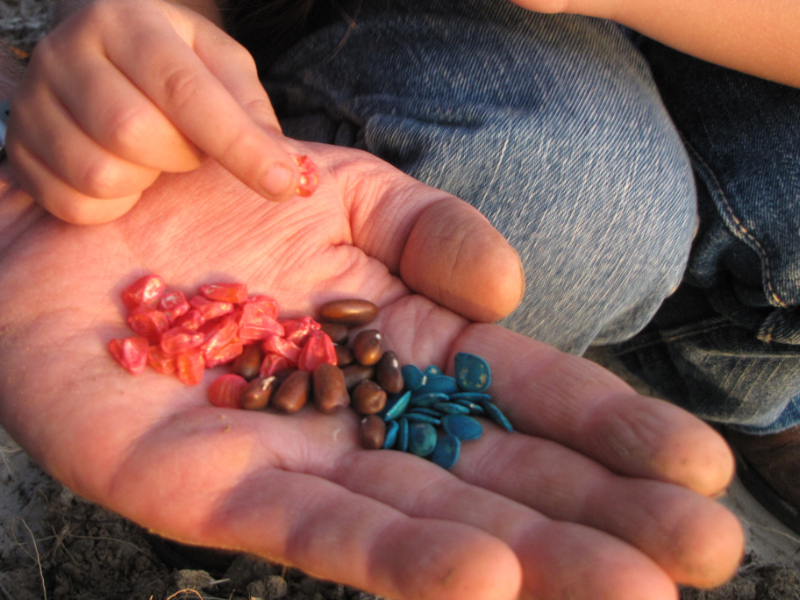 Beans: Harvest when the pods are around finger length. When the beans get too long, they become tough very quickly. Also, pulling beans when they are around finger length stimulates growth and helps produce more beans. Don’t leave the beans on the plant, as that may stop production. Squash: Harvest zucchini when they are 8” to 10” long, even with the flowers on them. Keep an eye on zucchini, as they grow extremely quickly, and you will quickly have a 10lb zucchini. Yellow squash when small and tender. Butternut when fully formed. You can let butternut get very large, but letting too many get too big will slow production. Squash, about 150+ pounds mixed squash if summer and winter squash equally planted. If you plant only zucchini, this excellent producer can generate 300 pounds of squash in this garden. 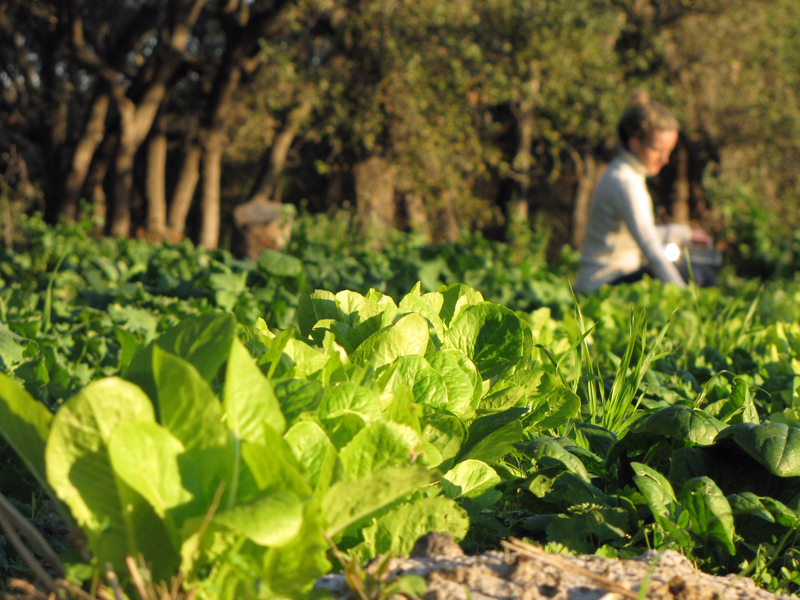 Note: a 9 square feet garden will not produce 10% of the 100 square feet garden. The 100 square feet garden is the optimum size, maximizing pollination, beneficial predators, living mulch, and all other factors, much better than a smaller garden. Corn is wind-pollinated. The ears are pollinated by the tops of the corn plants, which is blown down from the wind. That is why corn must be densely planted, to increase the opportunity for the pollen to reach the ears. If a cob forms with a lot of missing corn kernels, it was not sufficiently pollinated. You do not need to shake plants or do anything to help them pollinate, except make sure they are closely spaced, as described in this method. Corn Ear Worm: this is the biggest problem with corn in our area. It is a caterpillar that borrows into the ear and eats the corn, and turns the kernels to mush. 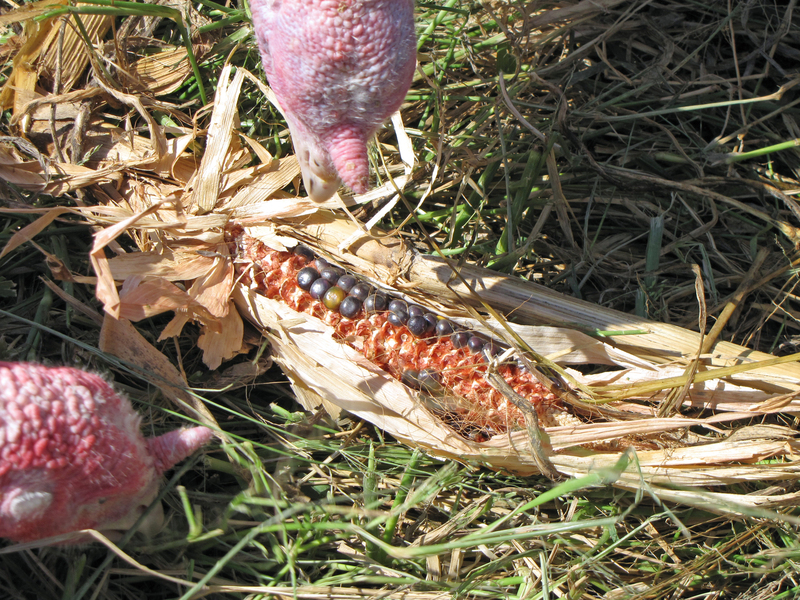 The commonly recommended solution is to apply a drop of mineral oil to the tip of the corn ear, to “smother” the corn worms. This has never worked for me, because 1) we have too much corn for this time-consuming method to be feasible, and 2) the mineral oil application only seems to work on about half the ears of corn. Our solution: as soon as you see the ear worms develop, spray Bt that very night on all the ears. Spray Bt again in three nights. You might need one more spray for a bad infestation. You have to spray as soon as you see the ear worms start working, before they bore into the ear. The other solution is to use the “pinch method” with a headlamp at night, as soon as you see the worms become active. This method is more time-consuming than Bt, but is nearly 100% effective. Beans are a nitrogen-fixer, which means they take nitrogen from the air and attach or “fix” the nitrogen molecules to bacteria in the soil. Sometimes the first planting of beans in a new area will not bear fruit, because the “inoculant” is not present in the soil (especially our poor soil in Rockport). 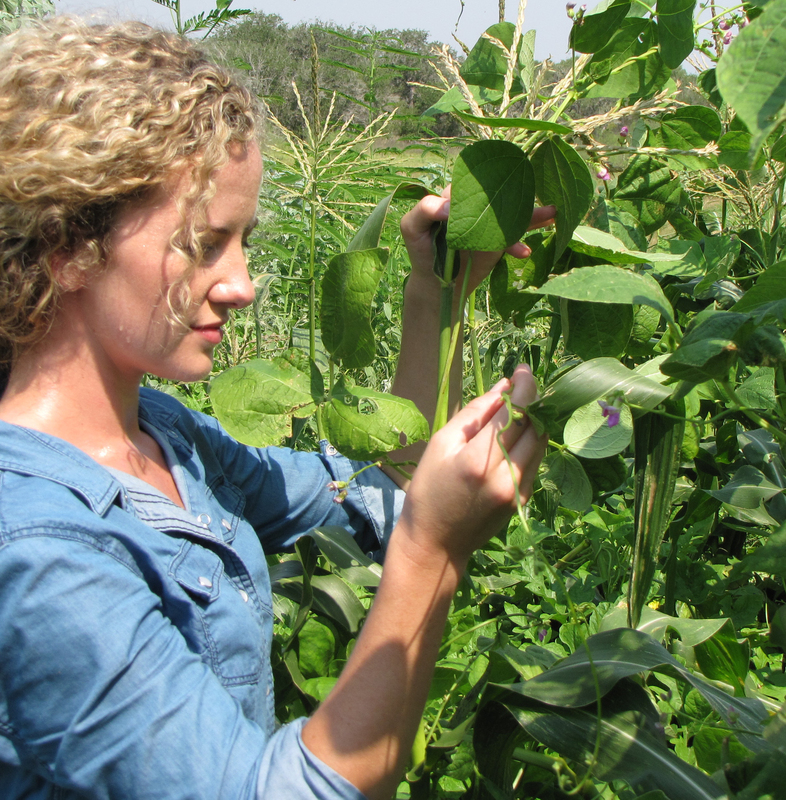 However, simply by growing the beans, you are adding the inoculant, along with wonderful nitrogen, to your soil. After the first season, you will enjoy many beans and other vegetables from this space. Squash bugs and squash beetles. Beneficial predators will get most of them. Pinching under a headlamp at night is effective; they are nearly impossible to pinch in the day, and they hide well. Plant a dill, Queen Anne’s lace, and a lot of nasturtiums throughout the squash or Three Sisters garden. These plants repel squash bugs and beetles very well. Caterpillars. Beneficial predators and pinching under a headlamp at night will take care of these. If caterpillars are very bad, in addition to pinching, spray Bt at night on the plants. Drench the leaves, and spray underneath the leaves very well. The caterpillar must eat the active Bt for it to kill the caterpillars. Powdery mildew and other fungal diseases. Powdery mildew can in some cases seriously impact yield. A simple solution once the mildew is present is to mix 4 tablespoon of baking soda with 8 teaspoons of vegetable oil into a gallon of water. Spray the leaves until they are drenched with this solution every week or so. A good prevention to fungal diseases is a bi-weekly spray of Garrett Juice, which strengthens the plants and helps them fight off diseases. Sometimes these vigorous growers can overwhelm the corn, and pull the corn stalks down. Try to remember to plant the vigorous vining plants on the end rows, or at least to train the vines to grow out away from the corn stalks. 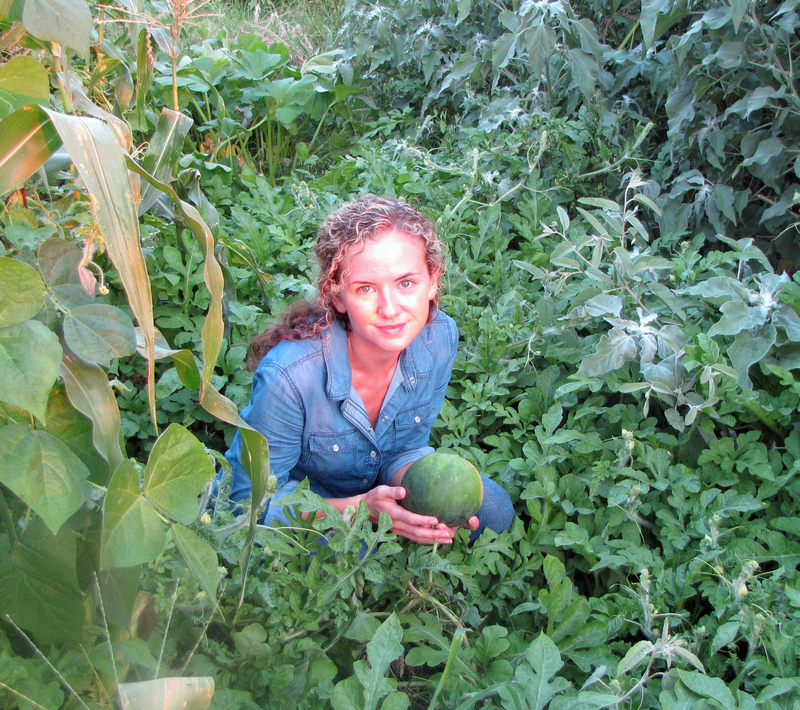 We plant all our melons on the outside rows of the gardens to prevent deer and raccoons from getting into the garden—this works really well. However, overdoing the melons can cause the some of the corn to come down. You can order the product from 1-800-SAY-RAIN. This is commercial drip line, NOT soaker hoses. The drip irrigation line goes under the mulch exactly where you want the water, down the center of the Three Sisters row. Water plants infrequently and deep (lower than the lowest level of root). Wait until the soil is almost dry, but not completely dried out, to water again. This allows the roots to “reach” down into the soil to find water, which causes the plant to grow. The soil will dry from the top down, especially in the relentless wind of Rockport. With correct mulching and intensive planting, you will typically water 1 time per week in April/May, 2 times per week in June/July, August may require 3 times per week. NOTE: after first planting the seeds, you may have to water more frequently, until the plants are established, because the roots are in the shallow soil that dries out faster. A “sunflower hedge row” or some other type of wind break may be helpful for the garden, to keep it from drying out so quickly, but only if it does not shade the garden. Water in the evening, or at night. Plants dedicate more energy into growing in the morning, and up-taking water in the evening. Watering in the evening allows for maximum water absorption, minimizes loss of water through evaporation, and helps cool the soil for the important night-time soil temperature. You should only have to water with the drip irrigation for a few hours to achieve maximum effectiveness, then you are probably wasting water. How to water without drip irrigation: After drip irrigation, the next most effective method to water is with the “rain” function on a garden hose. Water the plants about 2 to 3 times per week, as needed, in the evening or at night. Water more deeply than the roots. As a general rule, you can water sufficiently by holding the hose over planting for about 8 to 10 minutes. It is very hard to say how much water your plants need in terms of gallons, as it depends on health of soil, daytime tempurature, amount of mulch, and several factors. The garden will not always need the same amount of water. Make sure to water deeply, and as infrequently as possible. As your soil health improves, you will see a corresponding decrease in water needs in the garden. In year five of your garden, you will be stunned at how little water you need. To know when to water, find a place in the row, and dig your finger down about 6″ to 8″ into the soil, and check soil moisture. If soil is wet or soggy, let it dry out more. If the soil is dry, water the garden. Also, you can let the plants tell you when to water. Watch the leaves–when they begin to sag, water the garden. Don’t let the plants wilt, just notice the leaves. You will be able to tell pretty quickly what sagging leaves look like. Within 20 minutes of watering, the leaves will begin to perk up and turn a darker shade of green. Check the soil with your finger when the leaves sag, and you will quickly be able to figure out the relationship between soil moisture and the plants in your garden. Letting the garden tell you when to water is a wonderful part of your relationship to the garden, and your role in maintaining balance. 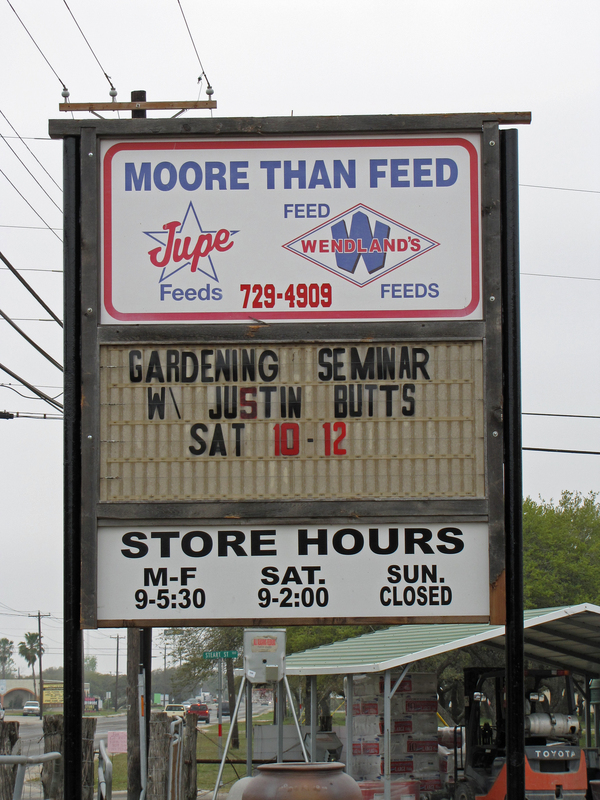 Garrett Juice: A homemade fertilizer = liquid seaweed + fish emulsion + molasses. We use one teaspoon of each per gallon of water. Spray the plants just until the leaves are drenched and dripping. Spray every couple weeks for best results to plants. Howard Garrett has numerous excellent recipes for homemade plant treatments on his web site The Dirt Doctor. We used “pepper and garlic tea” along with citrus oil extensively early in our farming, with somewhat limited success. The bugs in Rockport eat habanero peppers for dessert. “Compost tea” is very good preventative treatment. To make, simply fill a 5-gallon bucket a quarter full with good compost. Fill the bucket up with water, put on the lid, and leave in sun for a couple weeks. This is your concentrate. Strain this mixture into another bucket at one part concentrate plus four parts water. Spray this compost tea every couple weeks during the summer season to keep plants robust and help them fight insect and disease problems. You can also use commercial Lady Bug fertilizer, spray leaves until dripping, every two weeks. Or you can buy commercial Garrett Juice, and spray until leaves are dripping, every two weeks or as needed. Pastured poultry manure is the best bagged manure. Lightly side dress each plant with about 2 handfuls of pastured poultry manure, around 30 days after planting. We do not recommend horse or cow manure, because usually this manure lacks sufficient urea, which chickens produce in their manure. Also, consider the diet and living conditions of the animals that produce commercial cow manure—you do not want this in your garden. For peppers, try a 4-2-4 planting with dill and Queen Anne’s Lace flowers all around the peppers. Fertilize two weeks after trans-planting with a side dressing of pastured poultry manure, about two handfuls per plant. As necessary, every couple weeks or so, or if the plant looks bug damaged or stressed, spray the leaves until they are dripping with Garrett Juice or Lady Bug fertilizer. Most of our pest control comes from beneficial predators. They are: birds, wasps, dragonflies, lacewings, ladybugs, lizards, frogs, toads, giant wheel bugs, assassin bugs, etc. If you attract these predators to your garden, you’ll have to treat minimally for pests. To attract them, start a “beneficial predator garden” close to your vegetable garden. This could just be a corner of the lawn you don’t mow, or a beautiful hummingbird garden. The key is to have a dense “jungle” for the predators to hide in, when your garden is bare. When the garden becomes lush, and the pests arrive, simply stop watering the predator garden. The beneficial predators will go to the food source, and solve all your pest problems. If you spend a little time and energy making a sanctuary for beneficial predators, you will find they do an enormous amount of work for you, and save you a lot of time, money, and vegetables. An investment into beneficial predators yields an enormous pay-off. And if you are trying to get your children interested in gardening, this is the best way to do it. Kids love watching the natural interaction at work in the garden, especially when a wasp comes down, stings a caterpillar, then flies the caterpillar back to the wasp nest. This fascination with nature builds the child’s relationship to the garden, and gets them more interested in science and nature. Birds: Place a bird feeder in the closest tree to your garden to attract birds year-round to this area. In our area, nearly all of our smaller native birds eat both seeds and bugs. Cardinals are wonderful predators, and like most other birds prefer insects over forage, due to the higher protein content. 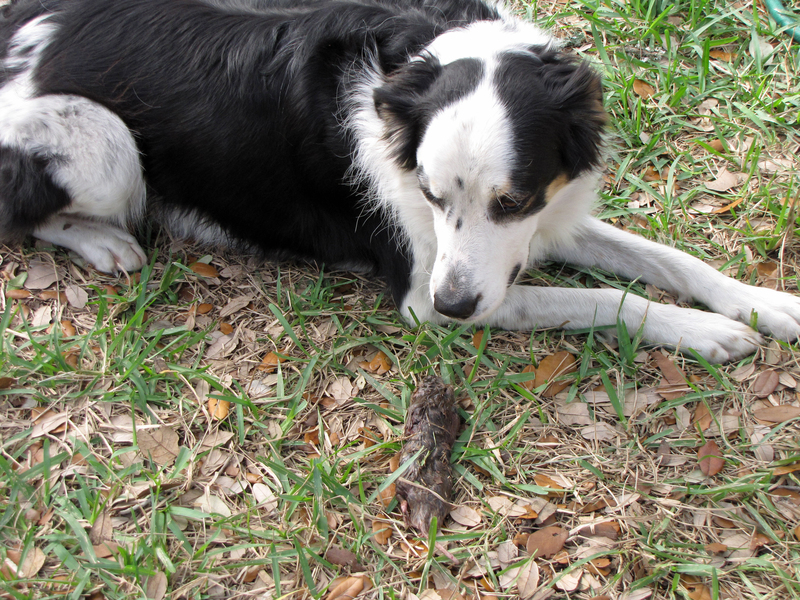 Once the birds discover your garden pests, they will make quick work of them. A great way to get birds into your garden is to place bird fountain close to the garden. In our desert climate, especially in our prolonged drought, birds and other beneficial predators continually look for water. A bird bath or, even better, a fountain, works as well or better than a feeder to continually attract birds to the garden. A trick we use to get birds into our large Three Sisters gardens is a common aerial water sprayer mounted on an 8-foot t-post in the middle of the garden. We tie the water sprayer to the top of the post, and turn it on for about an hour early in the mornings, when the pests (caterpillars, grasshoppers, leaf-footed bugs) are still active. The garden fills with birds who are attracted to the water. When the pests become wet, they have trouble moving. 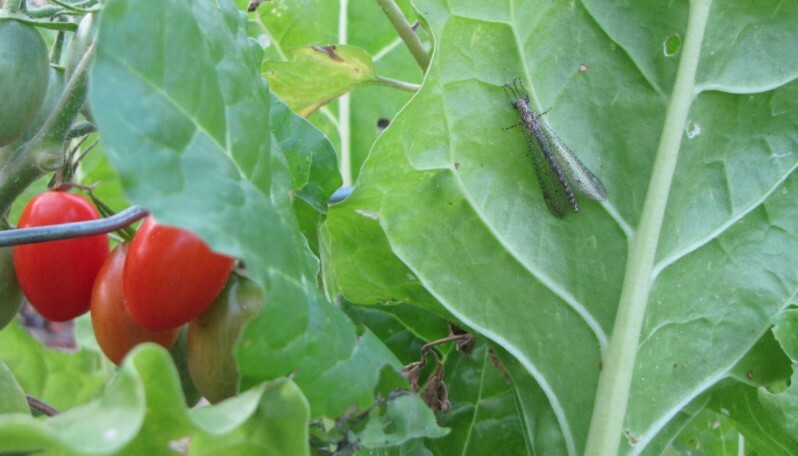 Caterpillars and grasshoppers become immobile for a short time, on the tops of leaves and vegetables. The birds can nearly wipe out a population of pests in a short time as they hop around the garden enjoying these easy meals. Example: One morning, I noticed my spaghetti squash were being devastated by little green caterpillars, a terrible infestation. I turned on the aerial water sprayer, and went to the house to get a drink; I expected a long morning of pinching caterpillars. By the time I got back to the garden, the birds were already active in the dense foliage of vegetables. While I watched, a flock of cardinals flitted all around the squash eating the caterpillars. I could hardly find a caterpillar after about an hour, when I turned off the water sprayer. At that point, there were wasps buzzing all around the squash, picking off the last remaining little green caterpillars. I did not have to pinch bugs that day, and went on with my chores. Wasps: Wasps are extremely beneficial in the garden. The only way to encourage wasps is to not destroy their nests. Unfortunately, so many people are so uninformed about wasps, and have an irrational fear of being stung, that wasps nests are usually destroyed as fast as they are built. Wasps do not kill caterpillars, but go into the garden and sting them to paralyze them. 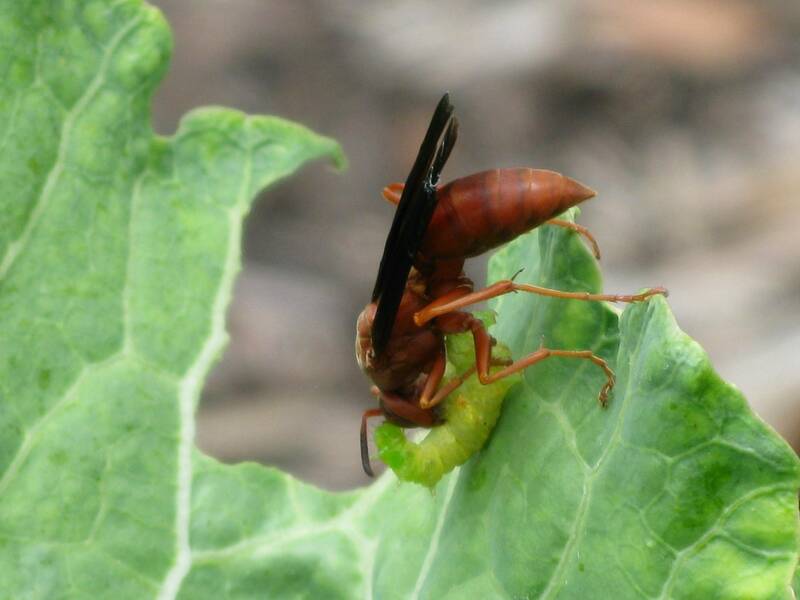 Then, the wasp flies the caterpillar back to their nest and stuffs the caterpillar into one of the holes in the nest. The wasp then lays her eggs in the caterpillar, and the babies eat their way out. The babies go across the network of the nest eating caterpillars. I have seen this phenomenon many times in the garden, and have followed wasps back their nests and watched them work. Wasps cleanse the garden of more pests than you realize; a single wasp nest can hold a lot of caterpillars. Wasps prefer to make their nests in the lower branches of trees, or in the eaves of houses and barns (mostly because their habitat has been destroyed). I recently had a great learning about wasps: a field of live oak trees was “manicured” by cutting the lower branches and making the trees look nice. Removing the lower branches of oak trees is very popular in our area, as it makes for a neat yard. As we picked up the branches to remove them from the field, I counted 4 wasp’s nests on the branches in one pile. I went through the cuttings and counted wasps nests, and could not believe how many I found, always on the largest branches. Then I went back and looked up in the trees, and only saw a couple of nests in the upper branches. Wasps like the lower branches for their nests, probably because they are more wind protected. By trimming the lower branches of our trees, we have removed a lot of good habitat for wasps, and then, when they make nests on the eaves of houses, we spray them. Reversing this trend would do wonders to keep down garden pests. On our farm, we say that we love the “wild” look, which saves me the work of trimming branches, and saves Kayla and me endless hours of pinching caterpillars, thanks to the wasps. Caterpillars reproduce much faster, and in greater numbers, than wasps. Destroying one wasp’s nest allows thousands of caterpillars to breed out of control. The destruction of wasp’s nests is the single greatest reason we have such a terrible infestation of web worms every year in Rockport. You can protect wasps in your yard simply by not destroying their nests. Over time, your garden will become a wasp friendly zone, and your garden pests should beware. I have worked for years with hundreds of wasps surrounding me all day, and have only been stung one time, and that was on the hand, when I grabbed a radish flower with a wasp on it. It stung for about 5 minutes, then completely went away. Wasp stings are highly over-rated. Please do not ever kill a wasp, or destroy a wasp’s nest. Mud Daubers: Mud daubers mainly eat spiders; some mud dauber species eat only a specific spider, like the brown recluse or black widow. The mud duaber stings and paralyzes the spider, then flies (or drags!) the spider back to the nest. The mud dauber’s nest looks like “organ pipes” on the inside. The dauber fills each organ pipe with living spiders. When the mud dauber eggs hatch, the babies eat the legs off of each spider in the nest, to keep the spiders alive longer, then go back and eat the spider heads and bodies. Please NEVER destroy a mud duaber nest, because you can’t possibly spray enough poison to control spiders in your yard as well as mud daubers can. Rather, wait till the holes open on the mud duaber nest, which means all the babies have left the nest. You can now safely remove the nest, because mud daubers do not re-use old nests. Ladybugs: Ladybugs are among the sweetest, most beautiful, and most deadly (if you are an aphid) beneficial predators in the garden. You may need to order ladybugs from the nursury, and “seed” them continually into your garden, until a population establishes itself. 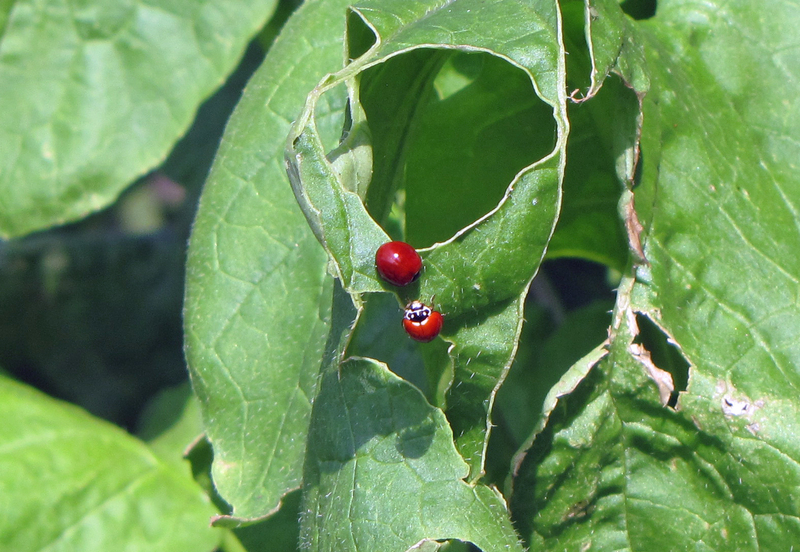 If there is not cover, or sanctuary, for your ladybugs, and if there is no food source, they will fly away. 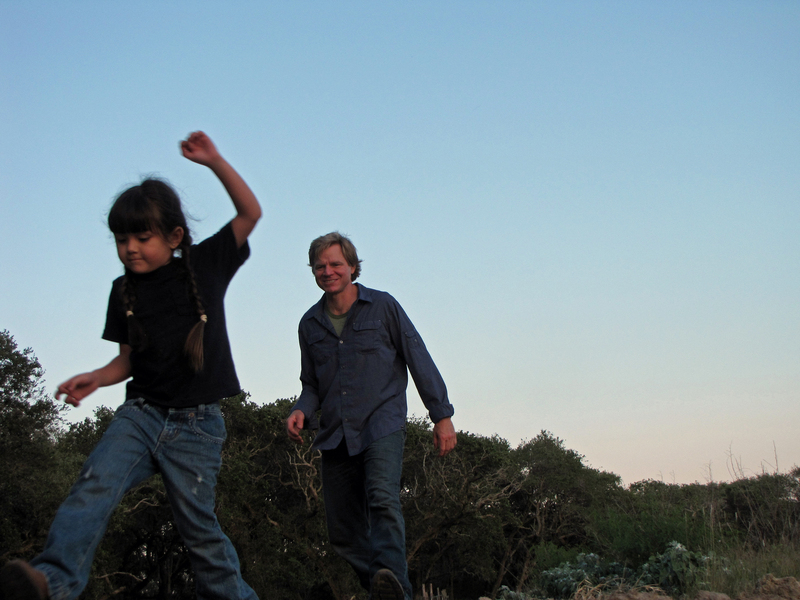 It took us a couple of years to create a really good native population of ladybugs. Ladybugs are like homing pigeons: if the ladybug grower shipped your ladybugs from California, and you don’t have a good sanctuary and food source in your garden, the ladybugs will fly en masse due West, until they find a welcome home. However, once your ladybugs become native, and as long as you have a good beneficial predator garden, you will have an abundance of these wonderful predators in your garden. Lacewings: It takes several “seedings” of lacewings to establish a native population. However, once you get these ravenous predators established, they will cleanse the gardens of pests many times over for you. You can order lacewings from Kunafin. Put out the lacewings at dusk. Prior to putting out the lacewings, spray your garden with molasses tea. Molasses tea is great to spray for ladybug seeding as well. Dragonflies: Dragonflies are one of the most ferocious and ravenous beneficial predators in the garden. Dragonflies consume incredible amounts of mosquitos. 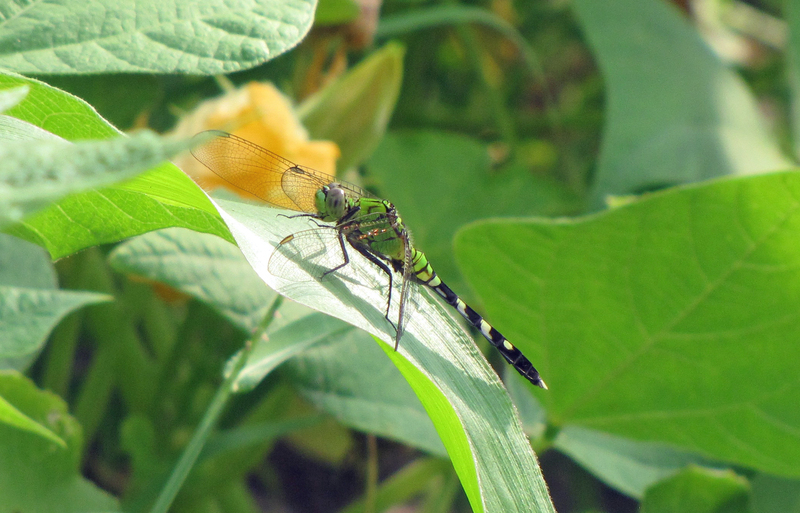 During the summer, dragonflies hunt in waves through our gardens. I have seen them pick up caterpillars, fly them into a tree, eat then, and drop into the garden for more. A bird bath close to the garden will also help attract dragonflies. Giant Wheel Bugs: When you find giant wheel bugs in your garden, you know you are on the right track with beneficial predators. These excellent predators look scary, but like the vast majority of the bugs in your garden, they are good guys, and they only hurt the pests. Assassin Bugs: Like giant wheel bugs, these friends of the garden let you know your predator gardens are working. Lizards: Lizards simply need sanctuary in your garden, and they will make themselves at home. A pan of water beneath the plants will help attract lizards. Lizards are the easiest beneficial predator to keep in our gardens, and they consume an enormous amount of insects. They kill pests from the ground up to the top of the plant, and they work steadily day and night, even on the hottest days of the year, in the shade of the garden, eliminating pests. Toads and frogs: A toad can eat over 10,000 insects in three months. If you can draw a good population of toads into your garden, can you imagine how many pests they are cleansing from your plants, while you sleep? Frogs eat even more than toads! Toads stay mostly on the ground. They will climb a plant for food up to a foot or so, but they don’t like to get too high. 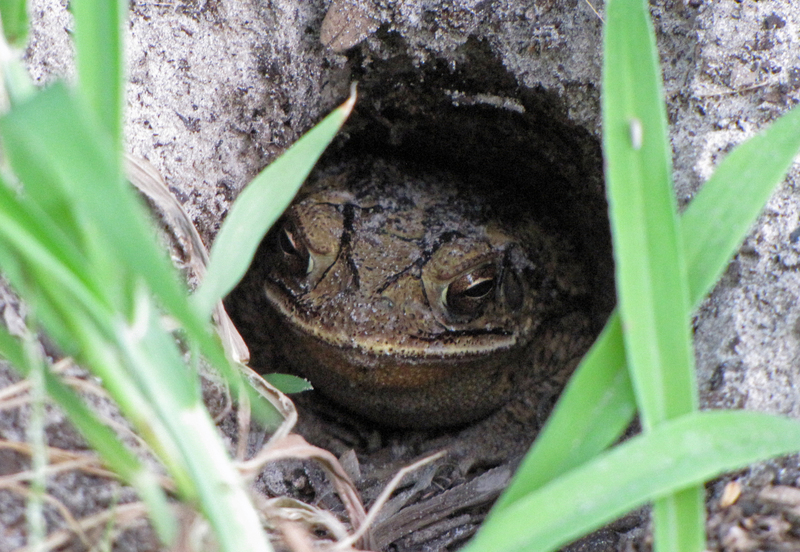 However, toads love to hang out at the base of vegetable plants and eat the bugs that crawl from the mulch up to the plant, and then back down in the morning. I have seen up to three or four toads on one spinach or lettuce, eating caterpillars as fast as they could. Toads and frogs need good cover in the garden, which you achieve with intensive successive companions. Frogs, especially smaller green frogs, tend to climb all over the plant, and like lizards, can work high up the plants at night. Also, toads love water. Leave pans full of water generously spaced throughout the garden, beneath the thick green canopy of squash leaves. The water will draw the toads into the garden, and they will appreciate the drink and cooling liquid during their hunts. Pans of water can vastly increase the number of toads, frogs, lizards, and birds in the garden. BT is an organic caterpillar spray that should be sprayed only at night, and on the underside of leaves, to kill caterpillars. 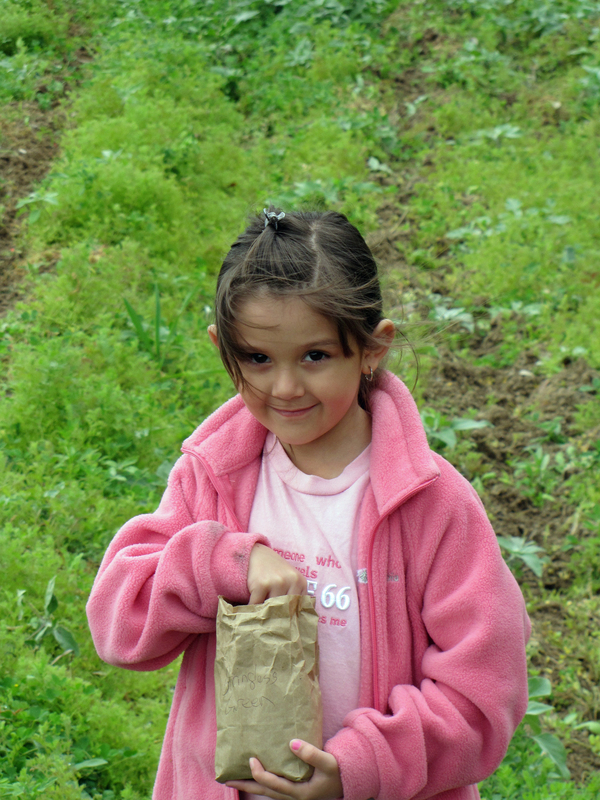 The most effective pesticide, after healthy soil, is a headlamp [show example]. The headlamp is a vital tool in understanding what is happening in your garden, in building your relationship with the garden. All garden pests are active in your garden at night. Some pests feed only at night. If you have never tried this, exploring your garden at night with a headlamp will be like seeing the garden for the first time. Most caterpillars, grasshoppers, and many other pests hide in the dirt during the day, and the underside of leaves. But they are all out at night, and they are attracted to the light of your headlamp. As you walk through the garden, the pests will come to the tops of plants, and struggle to get into the light for you to see them. In the past, you may have had trouble knowing what is destroying the garden. However, you will immediately know everything going on in your garden with a headlamp at night. With a headlamp, you can use the “pinch method” (which means pinching the bugs with your thumb and index finger) to eliminate a lot of pests, quickly and easily. Doing this at night saves a great deal of time, energy, labor, and gives you insights into what is attacking the garden. During the day, it is nearly impossible to pinch grasshoppers, caterpillars and leaf-footed bugs. At night, however, you can pinch more pests in 20 minutes than you could during 8 hours of daylight. The pests will literally come to you. (Give example of leaf-footed bugs.) They sting the tomato and it gets a sun-burned, dry appearance. 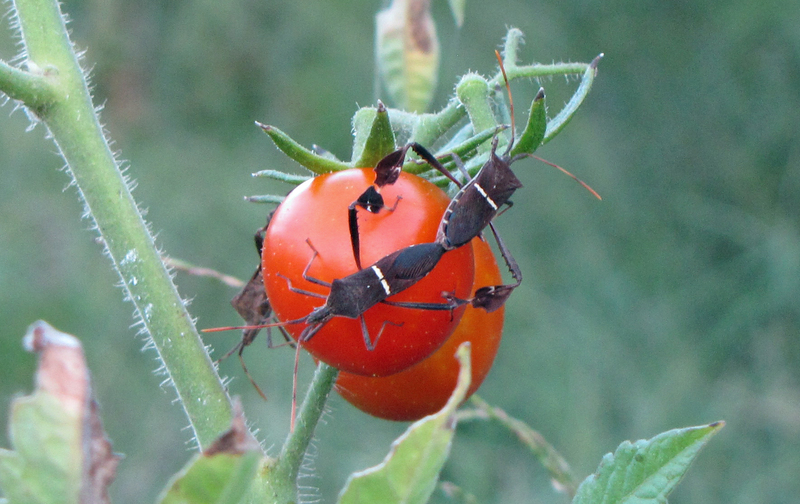 Leaf-footed bugs have a bacteria on their proboscis that causes the tomato to have spots. Many predators don’t like them and others can’t catch them because they can fly. To my knowledge, its only enemy is the banana spider. So, the only safe, effective way to remove them is to pinch them. We began to notice that leaf-footed bugs were evading us to avoid being squashed during the day. They will crawl to the other side of the plant, or fly to an entirely different row. However, with a head lamp, you can kill nearly all the leaf-footed bugs in 30 minutes a night for one or two nights. When your program is in balance (healthy soil, intensive successive companion plants, mulch, beneficial predators), you will not spend very much time pinching bugs. (I have only pinched bugs on 2 nights, 20 minutes each, in the last 4 months; in summer, maybe 20/30 minutes every two weeks) You will still have pests in the garden; however, the beneficial predators will take care of most of them, so your vegetables don’t suffer. Your job as a gardener will be to bring balance during the first part of the infestation, until the predators catch up. In nature, there is always a steep increase in the population of pests, then a steep increase in predators, then pest population declines. In the garden: fast population rise in pests>garden damage>rise in population of predators>balance. Your role is to be present in the garden during the short time between the rise in pests and the rise in predators. In our garden, this is usually about 15-30 mins per night for 2 nights, for each infestation. Check on the 3rd night and you should see plenty of frogs, toads, and lizards, and during the day there will be wasps, birds, dragonflies, lacewings, and etc., and you won’t have to pinch (I leave the pests for the predators to enjoy). You only need to protect your garden from the pest infestation for two nights as the predator population catches up to the pests to restore balance. If you get a really bad infestation, you may have to do more pinching; however, in a healthy garden, predators will be standing in line to eat pests. Gophers = a good dog, a good cat, traps, or gopher snakes. Squirrels=squirrel stew, pellet gun. Cut ants=molasses tea or turpentine in a funnel down the hole; NO chemicals eliminate cut ants, you can only move their mound, so do not leave poison in the ground for years. Please leave questions of comments on the “comments” section of this post. Happy Gardening to you! Kayla planted this garden with hairy vetch on New Year’s Day. It took her about ten minutes to plant this space with a nice cover crop. Her ten minutes of planting will reap a lot of rewards in this garden. increase the bio-diversity of the soil. In Rockport, hairy vetch is best planted between November and February. Vetch is winter hardy, and a freeze will not kill it. Up north, they plant vetch in August or September, before the first killing frost, and the vetch winters under a thick blanket of snow, and resumes growing in the spring when the snow is gone. It takes about 90 days for vetch to fully mature, and create beautiful purple blooms. When the vetch is ready, you can cut it down for a garden full of thick mulch, and then plant vegetables in it. 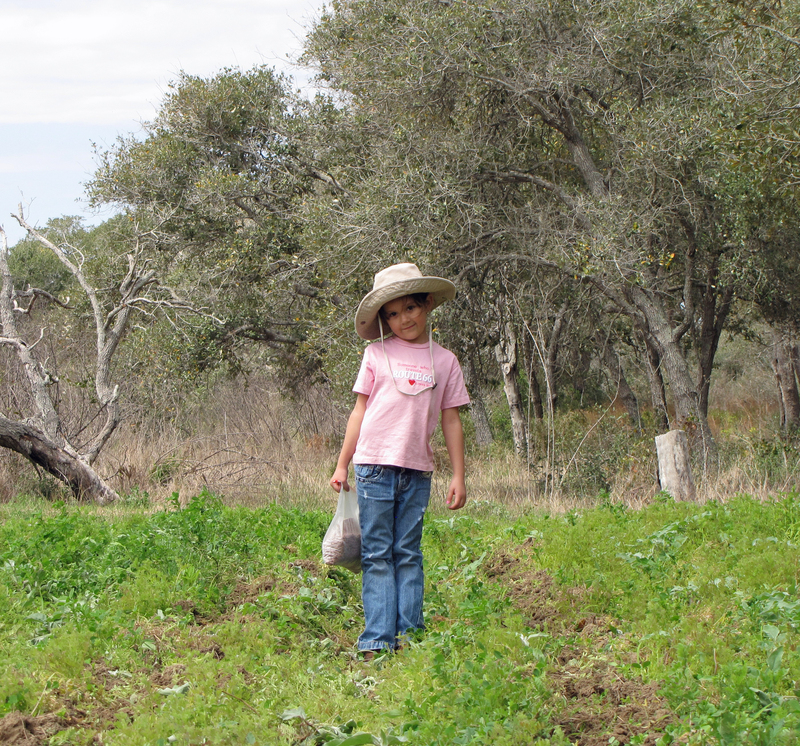 By using vetch, no herbicides, soil preparation, or mulching is needed to plant vegetables. 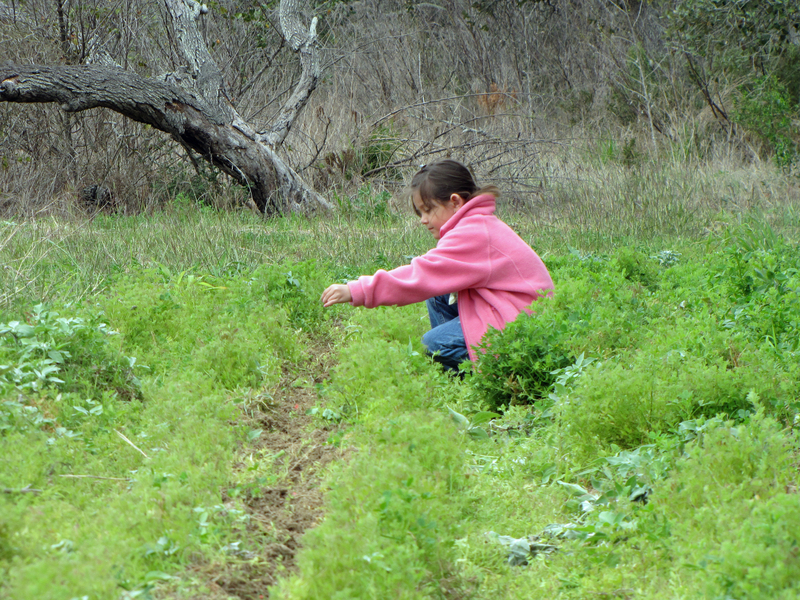 Or, the vetch can be plowed under. Or, animals (chickens and pigs especially) can be grazed on the vetch, to eat it to the ground. Grazing animals on a vetch patch is one of the best things a gardener can do to improve soil health. Additionally, other plants can be combined with vetch. Vetch can be used as a companion planting with tomatoes or a Three Sisters garden. Gardeners often mix winter rye with vetch, as a premium cover crop that also makes excellent animal fodder. Vetch takes nitrogen from the atmosphere, carries it down to the plant’s roots, and “fixes” it to bacteria in the soil. The nitrogen is then available to the next crop planted in that soil. 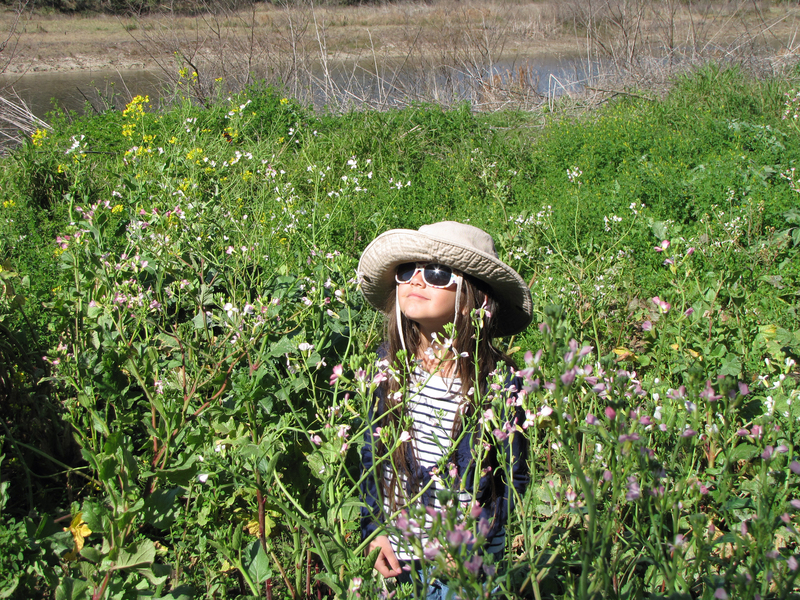 This is called the “green manure” effect. I slept through every science class from 1st grade through college, but this dynamic fascinates me. Vetch adds between 90 and 200 pounds of nitrogen per acre. That is an enormous amount of fertilizer created simply by growing a plant. Modern large-scale farms use “chemical nitrogen fixation”, also called “industrial nitrogen fixation”, to add nitrogen. In other words, they use synthetic chemicals to fix nitrogen. This is how big corporate farms (and many small-scale farmers and backyard gardeners) fertilize their crops. Before these chemicals were invented–basically all of human history prior to World War II–farmers used “biological nitrogen fixation”, or cover crops, to fix nitrogen into the soil. Thomas Jefferson, in his Farm Book and letters, writes extensively about the benefits of cover crops. In a letter to George Washington, dated June 19, 1796, Jefferson writes, “…but true winter vetch is what we want extremely…” Jefferson routinely rotated vetch or clover in his gardens, plowing them under in the spring, or grazing animals on the mature crop. Before chemicals, all farmers used cover crops and manure. 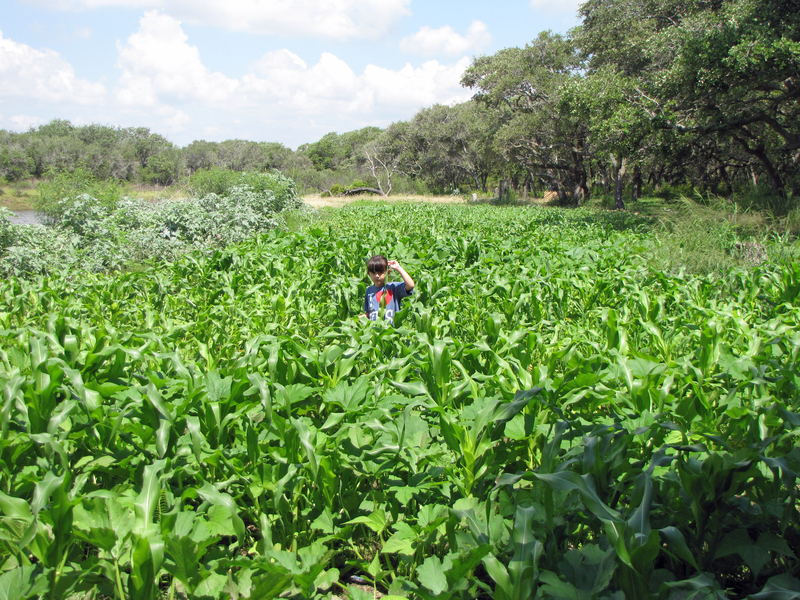 Today, it is rare to find a farm that uses cover crops and manure to grow vegetables. In addition to its benefits as green manure, vetch also prevents weeds by choking them out and serving as a living mulch. Because vetch is about 20% protein, which is extremely protein-rich for a plant, it makes excellent animal fodder. Vetch also makes a good home for beneficial predators, and keeps them patrolling the garden between vegetable plantings. Bees love the purple blooms. Vetch can be hand broadcast, which simply means to throw it across the garden. Start in one corner and work your way across, evenly spreading the seeds. You can cover a full acre with about 25 to 35 pounds of vetch seeds. If you are planting a smaller area, estimate the pounds of seeds you will need for that space. Place the seeds you will plant in a pot or bag, and carry that with you as you plant the garden. You can use the declining volume of seeds in your pot to determine how much to cast, and thus make sure you achieve an even and adequate covering. Save the remaining seeds in a cool place until the next planting. 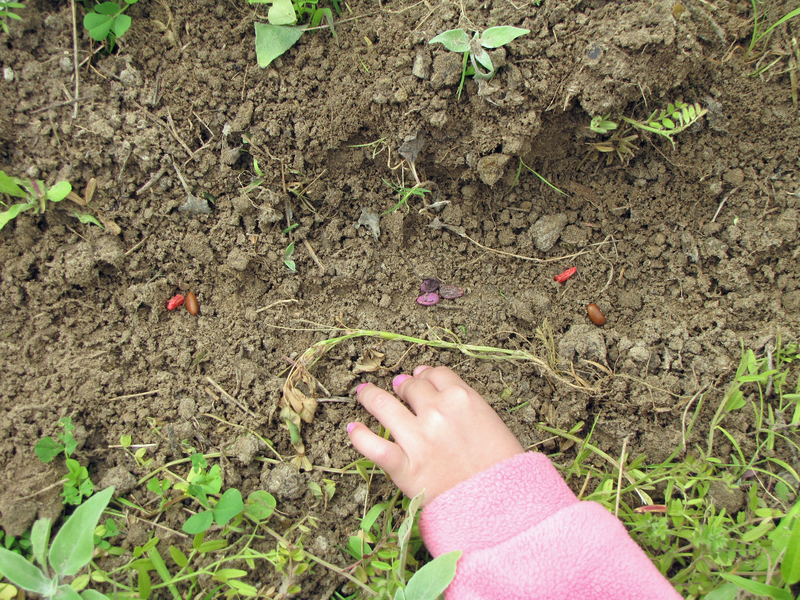 The seeds require good seed-to-soil contact to ensure germination and root development. 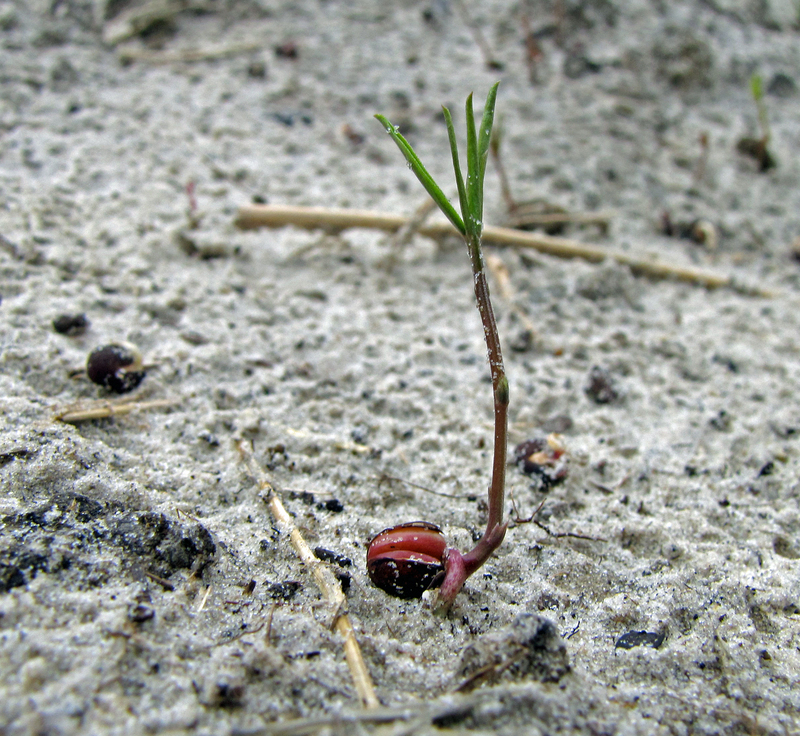 Notice the seed in this picture sends a shoot up, and a root into the soil. You should till up your garden space prior to planting, rather than broadcasting seeds into a field full of weeds or grass. Water the vetch planting once or twice per week after broadcasting, until the plants are established. Hairy vetch is drought tolerant, but needs some moisture to get started. 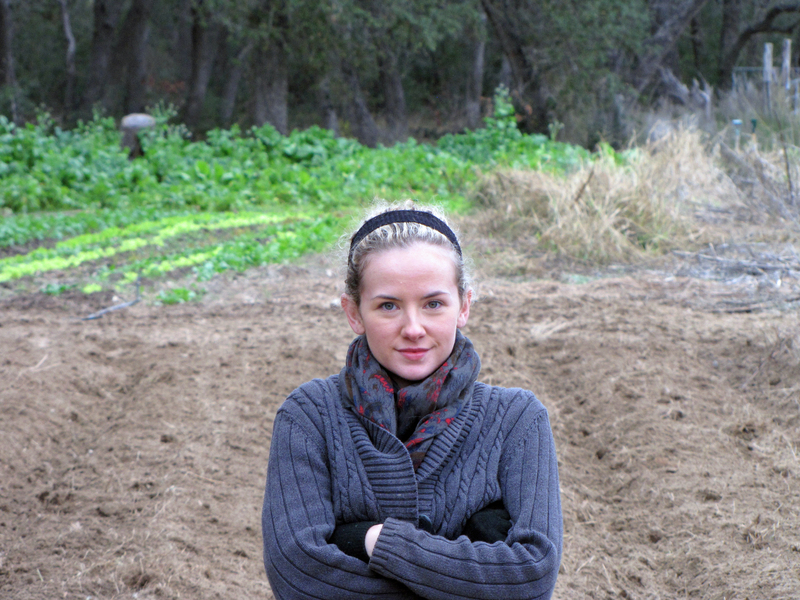 We had just moved chickens off of this 2,000 square foot garden, before Kayla went out to plant it with vetch. 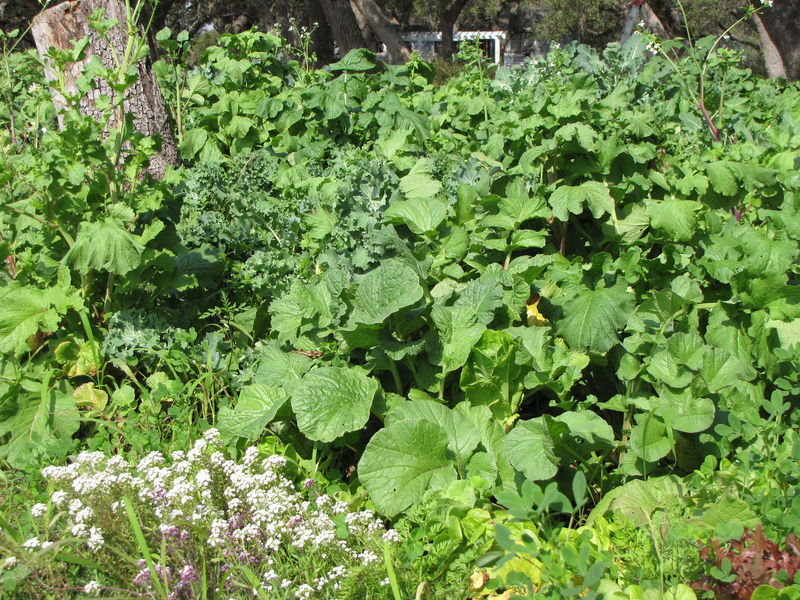 The chickens had eaten down all the remnants of corn, beans, squash, cucumbers, melons, herbs, and wildflowers, to leave a completely bare space. Then we quickly formed the rows you see behind Kayla. We will plant Three Sisters in these rows once the vetch grows thick. 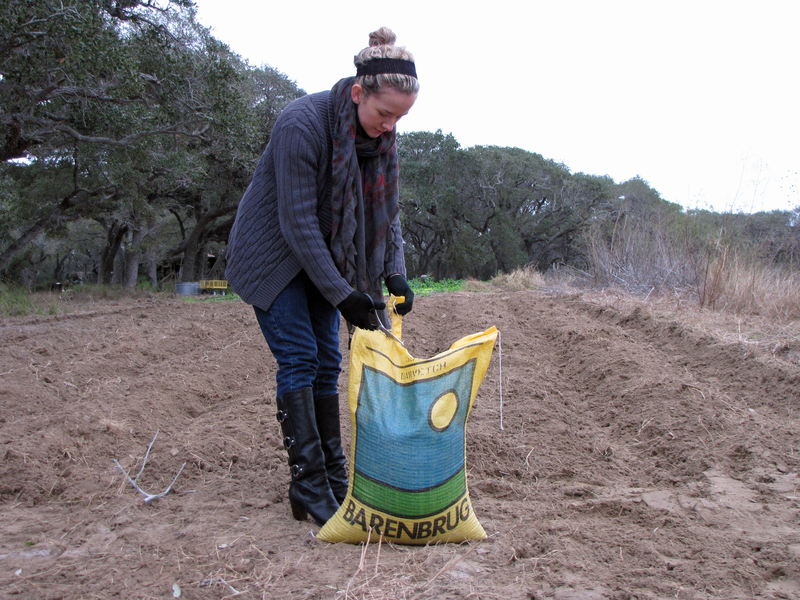 We will give an update on this garden, and post pictures, to show how the vetch develops, and to see what kind of return we get from Kayla’s ten minutes of planting on New Year’s Day.